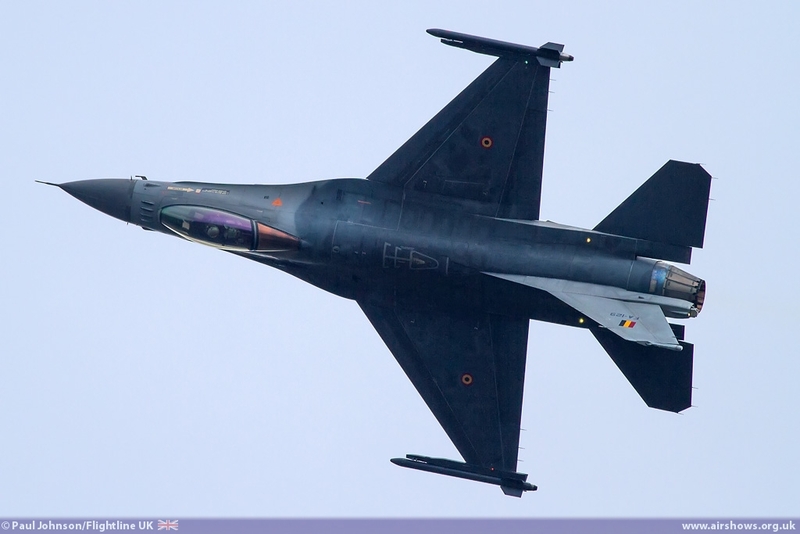 The 2013 International Sanicole Airshow was the only major air display to be held in Belgium this year. 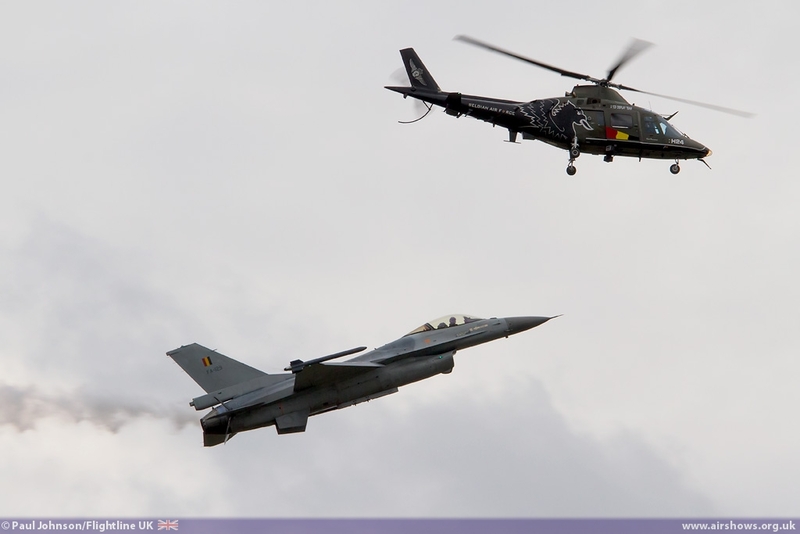 Sanicole remains the country’s only civilian run airshow and 2013 has seen the Belgian military take a break from organising their own event in preparation for a very large event at Kleine Brogel next year. 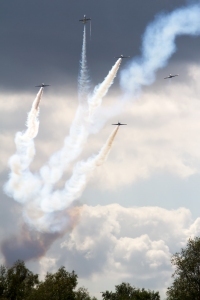 Despite the relatively small airfield, the show brings together an amazing international air display involving military and civilian display acts from across Europe and beyond for a spectacular eight hour flying display. 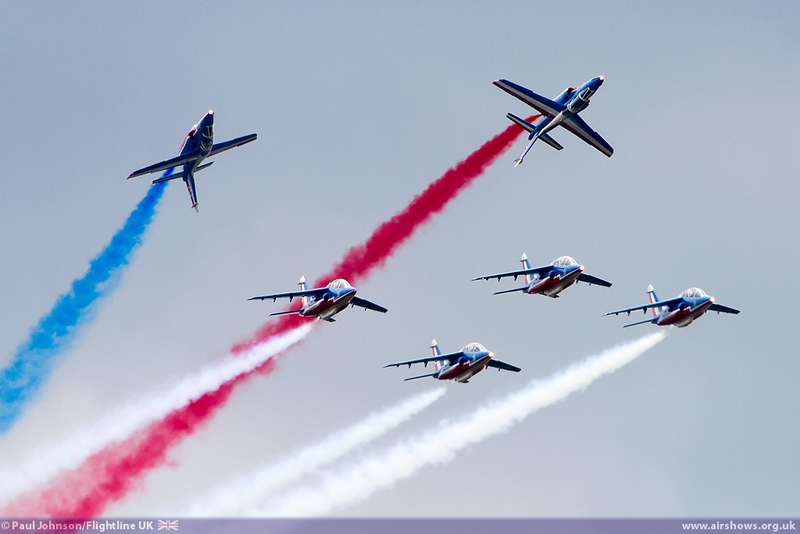 The International Sanicole Airshow celebrated its 37th Edition this year. 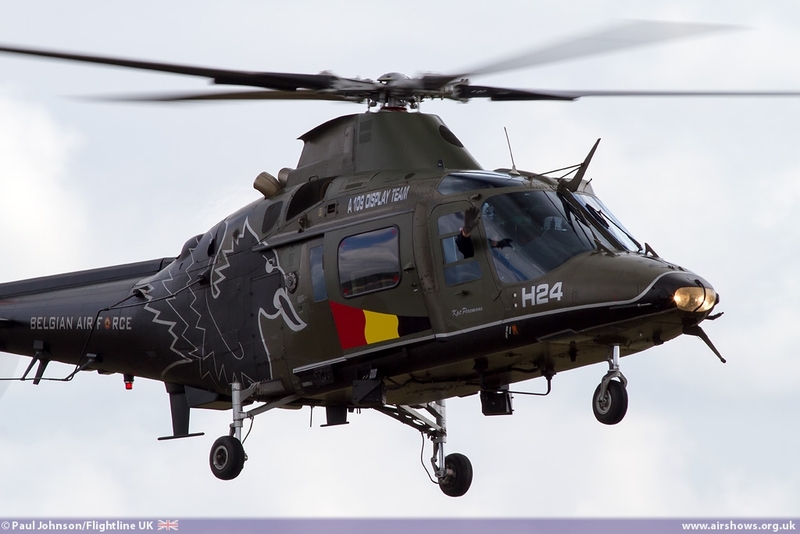 It started in a time when many Belgian airfields ran their own airshows but today is Belgium’s only civilian run airshow. 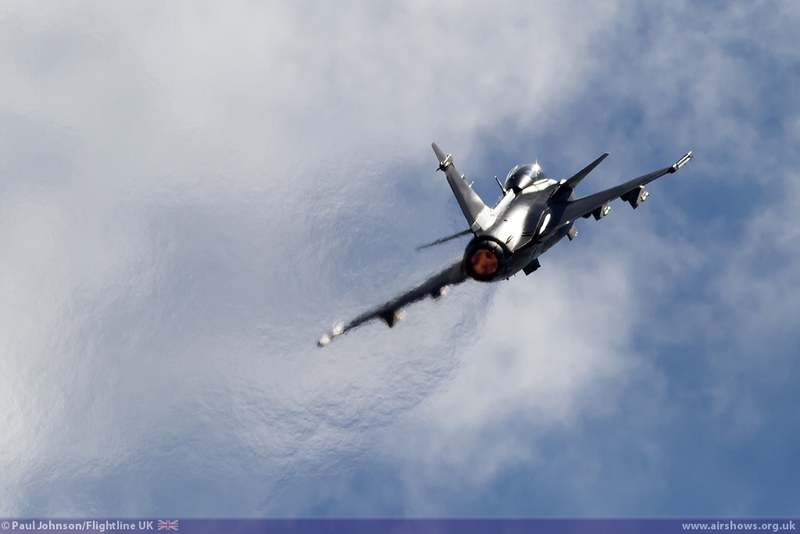 For a UK visitor, it is hard to grasp just how such a small airfield hosts such a major display. Sanicole is essentially a very small general aviation airfield boasting just one short and narrow hard runway and a few hangars in amongst a very large area of countryside set aside for military training. 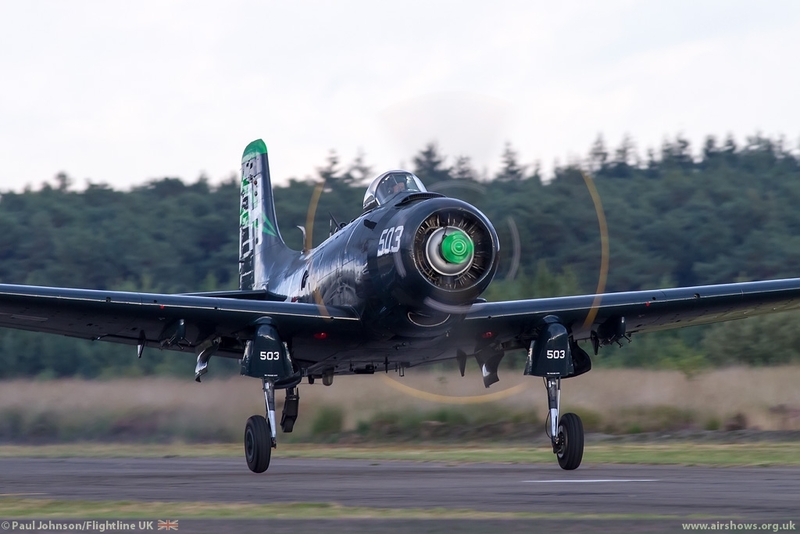 The airstrip is just large enough to cater for warbirds with the likes of Skyraider and Avenger just able to use the strip when it is relatively empty, though for the weekend they relocated to nearby Kleine Brogel. It is however not so difficult to see why this airshow has grown to such an important event when you meet the team behind the event. Both Geoffrey and Gilbert Buekenberghs have built up a very ambitious and innovative team that consistently produce such a brilliant show and atmosphere that keeps people coming back from across Europe year after year. 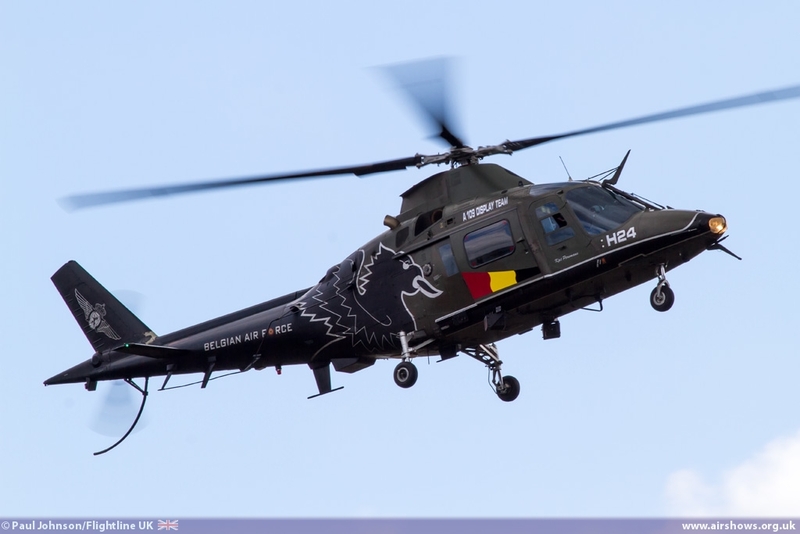 Such an airshow would not be possible without great support from the Belgian Military and both the Air Force and Army give wide ranging support. In particular Kleine Brogel Air Base provides facilities for many of the visiting displays to operate from as well as support on the ground. 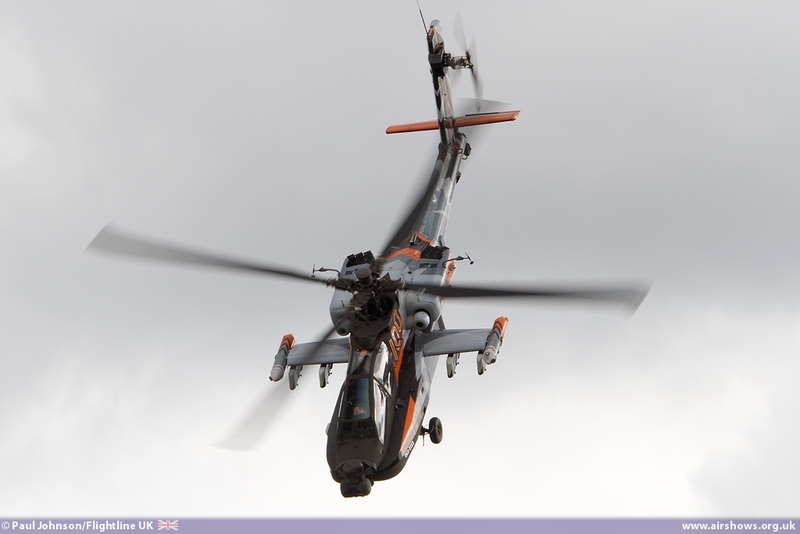 This year the base even hosted its own open day for enthusiasts to see the aircraft on the ground on the Saturday. 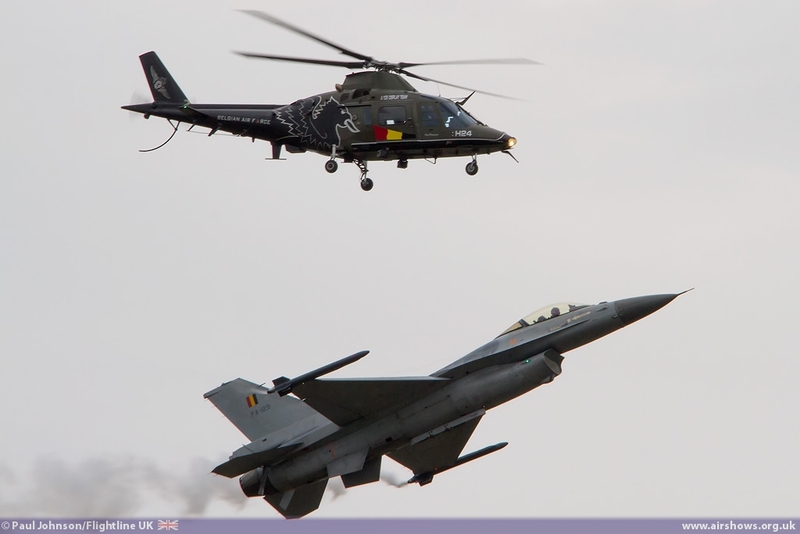 2014 will see “KB” hold the Air Force Days over the traditional September slot for Sanicole to celebrate 100 years of Belgian Air Power with support from the Sanicole team. 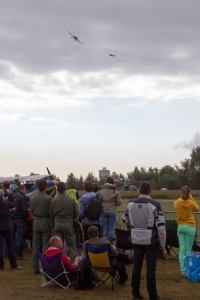 The scope of the flying at Sanicole is impressive – there are few shows that combine some of the rarest European military hardware with warbirds, modern airliners, general aviation and aerobatic displays. 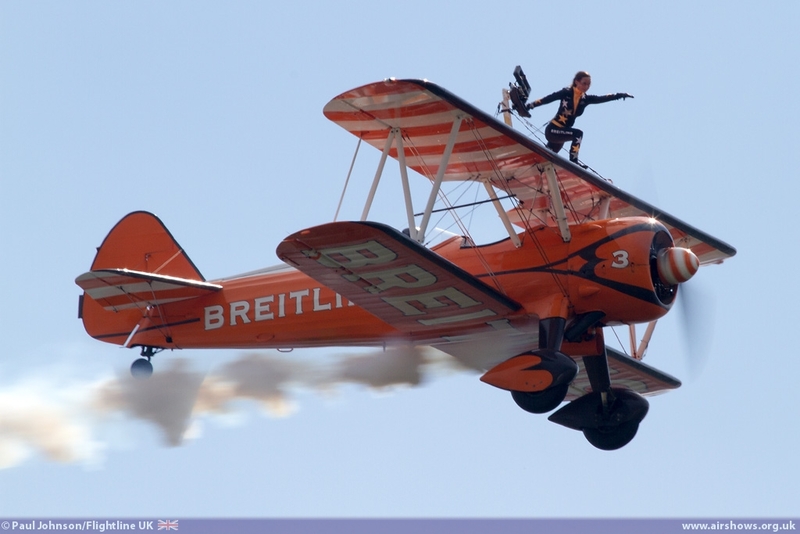 As with Eastbourne this year, Disney had chosen Sanicole as a venue to highlight the release of “Planes” which takes place in October in Belgium and big screens were placed on the far side of the aerodrome. 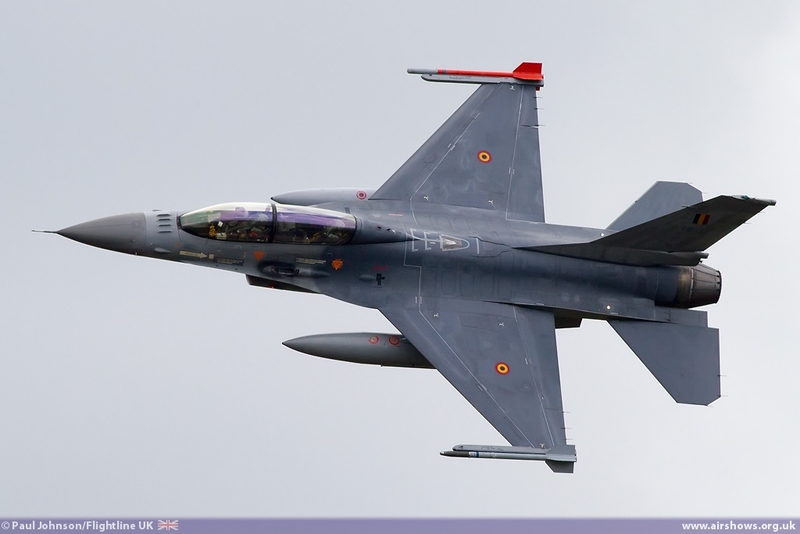 It was good to see full use made of the screens (once some calibration and power issues were sorted) with some great introduction videos for some of the displays and Planes TV feeding their live filming to them. 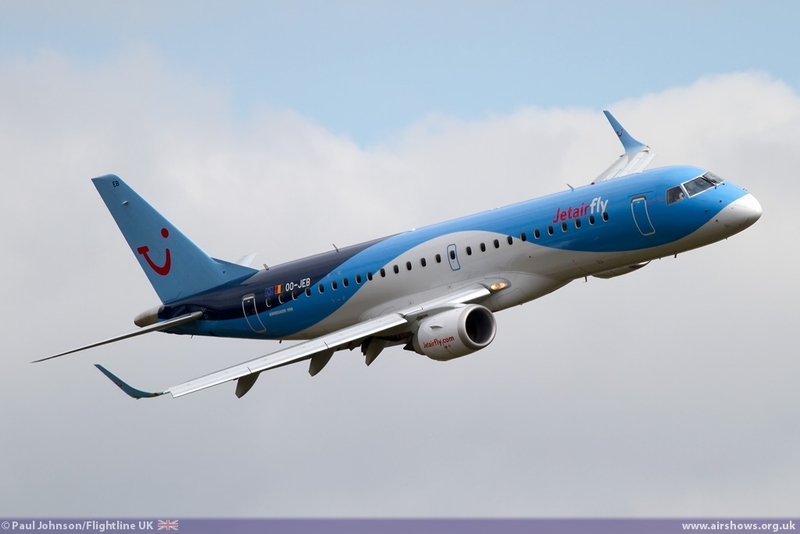 Sadly the weather across Northern and Southern Europe did take its toll on the line-up. The Salzburg based Hangar 7 were unable to leave their base due to some very inclement weather which was a big shame as it included the TAH-1F Cobra, Corsair and Cessna Skymaster “Push-Pull.” Sadly a ground handling accident at an event in Germany also prevented the P-38 from attending and the Schlepp was also a casualty of the weather. However, with the Spotters Day at Kleine Brogel attracting more acts, the Sanicole team were able to plug the gaps with some more exciting performers for their show to fill the gaps! 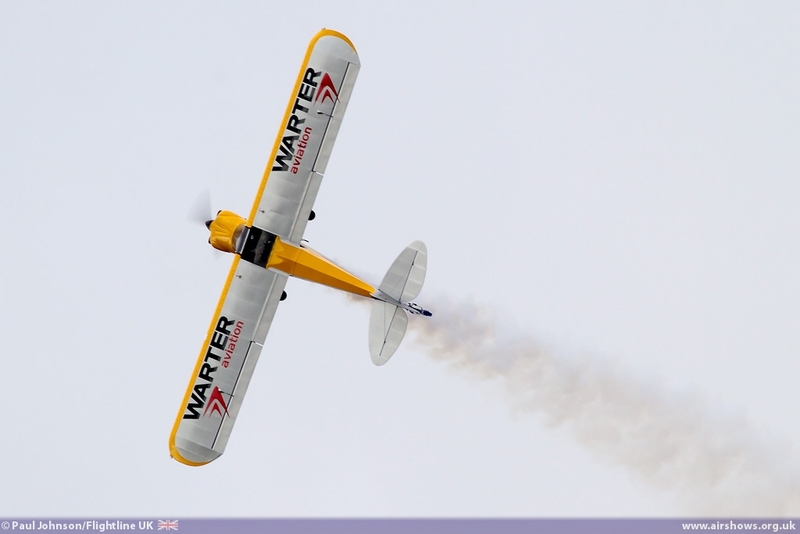 Getting things underway at 10am after some impressive radio controlled models warmed up the crowd was a Cubcrafters Carbon Cub SS carrying the company colours of Warter Aviation Fuels, one the other sponsors of the show. 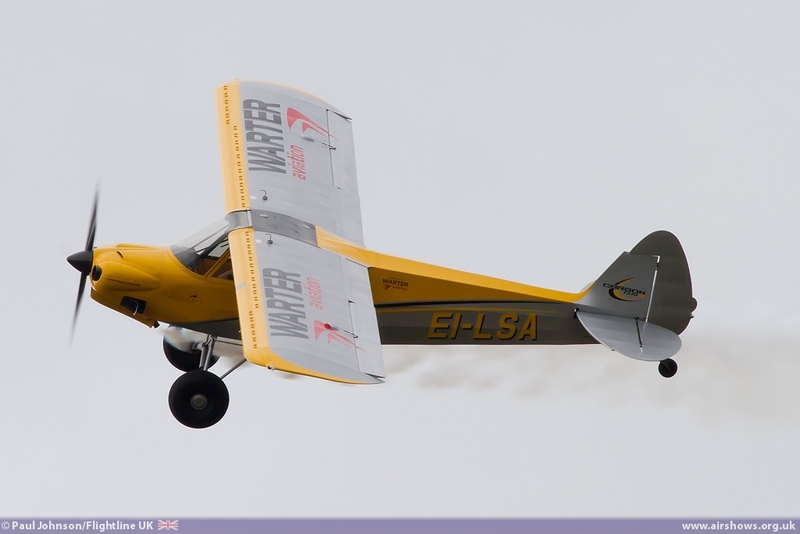 The Carbon Cub is based on the legendary Piper Super Cub, but as the same suggests it features a significant amount of Carbon Fibre in its construction. 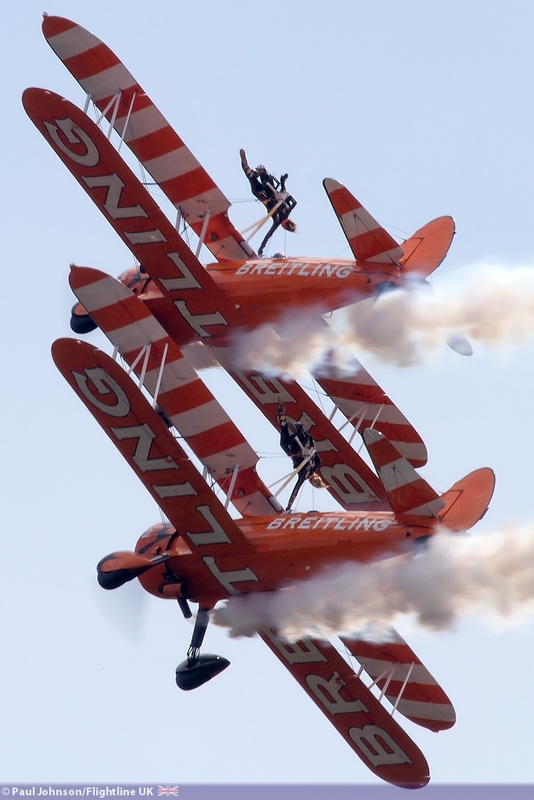 Combined with a 180hp engine and powerful propeller, it has the best climb performance of any aircraft in its class and this was demonstrated effectively at the show. 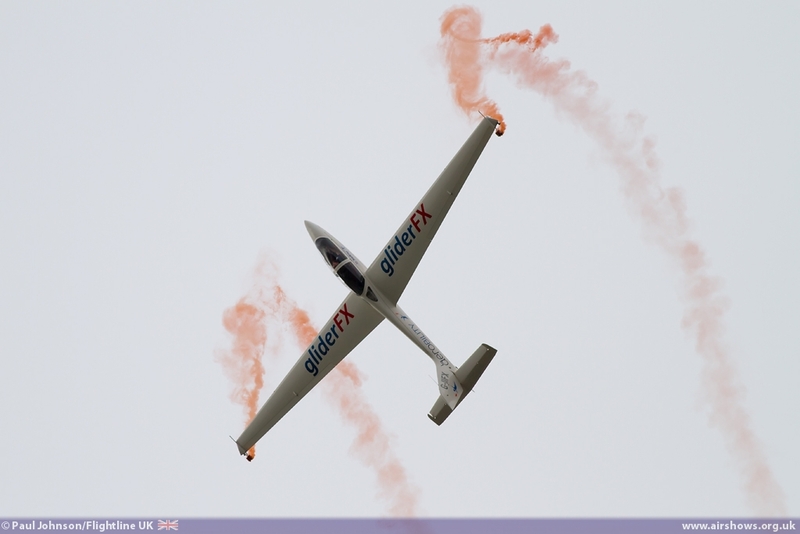 The Carbon Cub was just one of a number of civilian displays at the show. 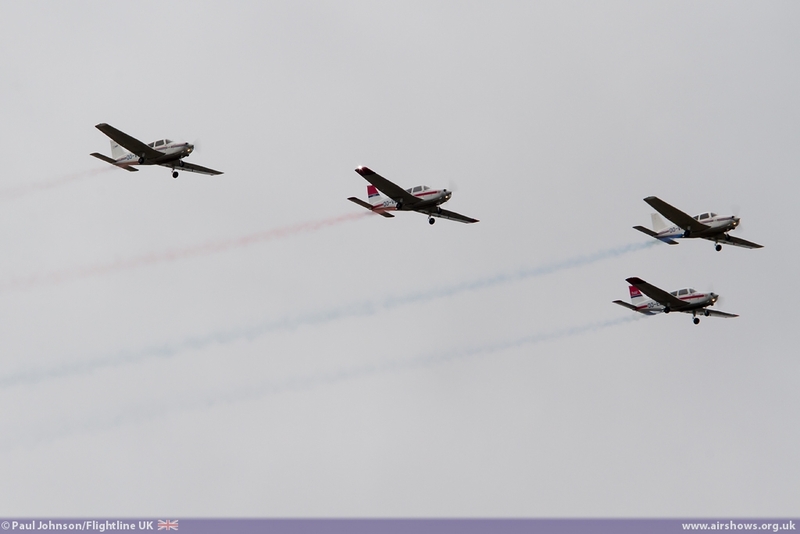 The General Aviation theme was continued by one of the home teams, the Victors. 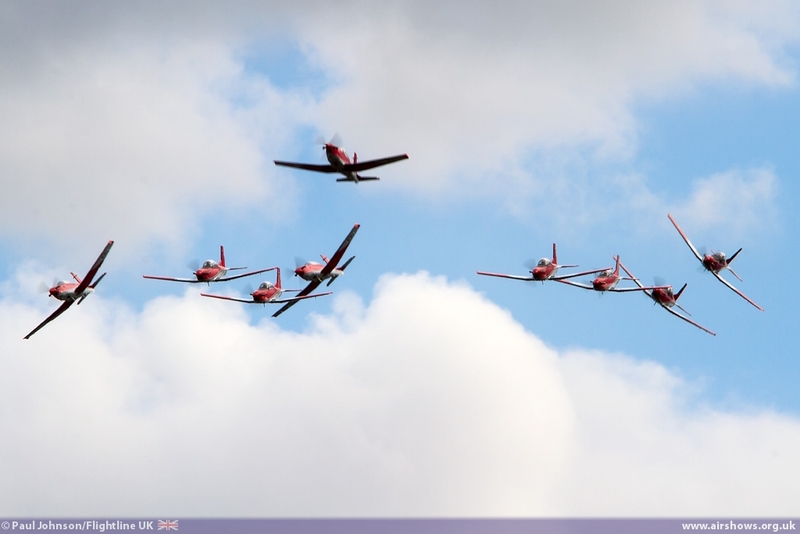 The team fly a four-ship formation routine using the venerable Piper Cherokee. 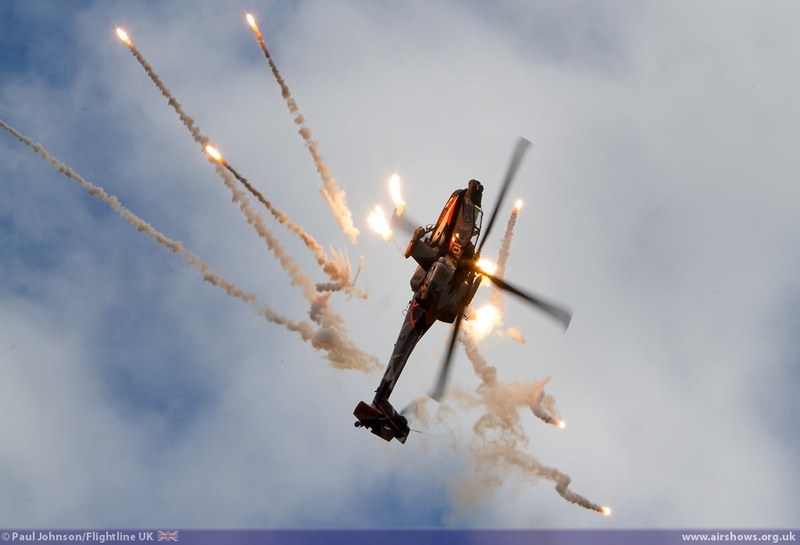 Despite all the disadvantages the Cherokee has, the team put on an impressive show complete with coloured display smoke. Aerobatic acts always feature well at Sanicole. 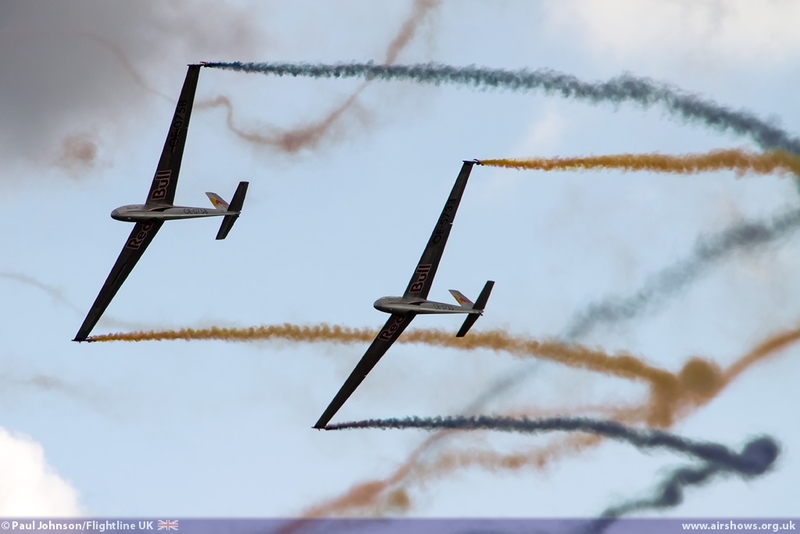 There were two Glider display teams at the show. 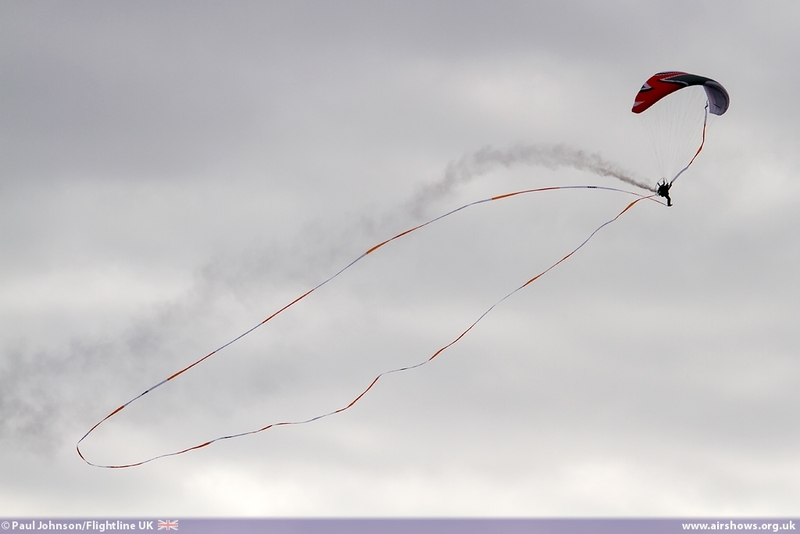 GliderFX returned to Sanicole with their “new” MDM-1 Fox Glider, RAFGSA Piper PA25 Pawnee and new for 2013, UK Paramotor Champion Michel Carnet. 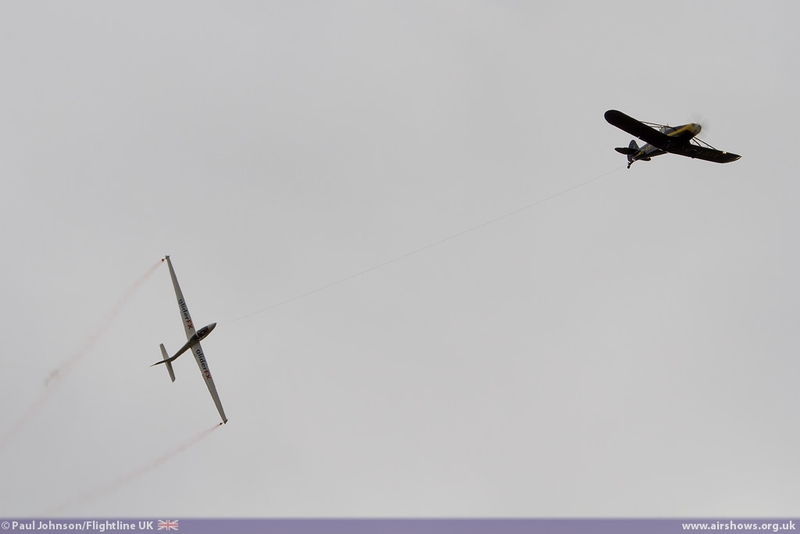 The team performed the traditional low level Glider display with Guy Westgate rolling the Fox while still on Tow. 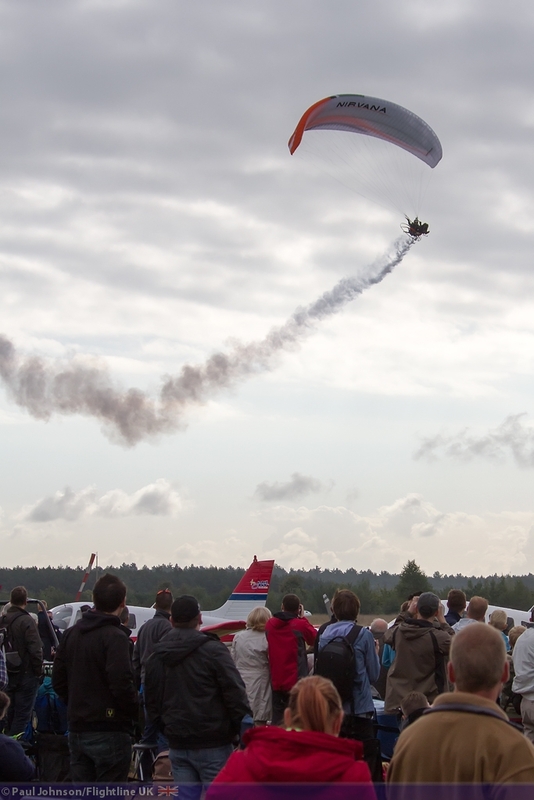 The gap in between while the combination climb for height is filled by Michel who puts on a very close-up display of Paramotor flying towing a 200m from his feet to highlight the freedom this new and relatively inexpensive form of aviation offers. 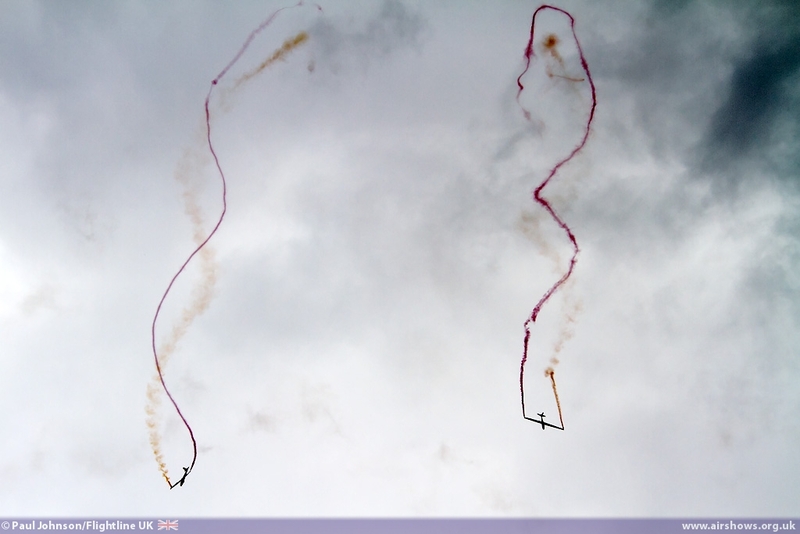 The finale of GliderFX’s display is the stunning solo by the Fox which is capable if flicks, tumbles and rolls which is always surprising to the crowd. 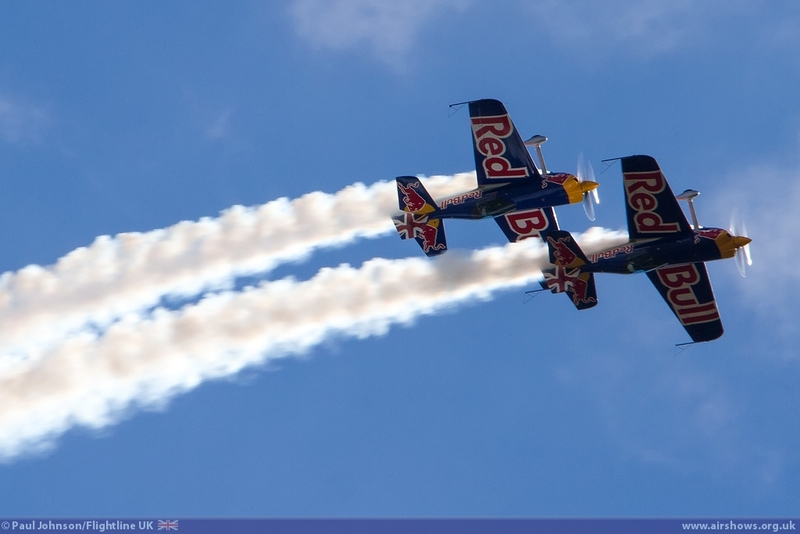 The second glider team were the Red Bull Blanix Team. The Let L13 Blanix glider is very different from the Fox. 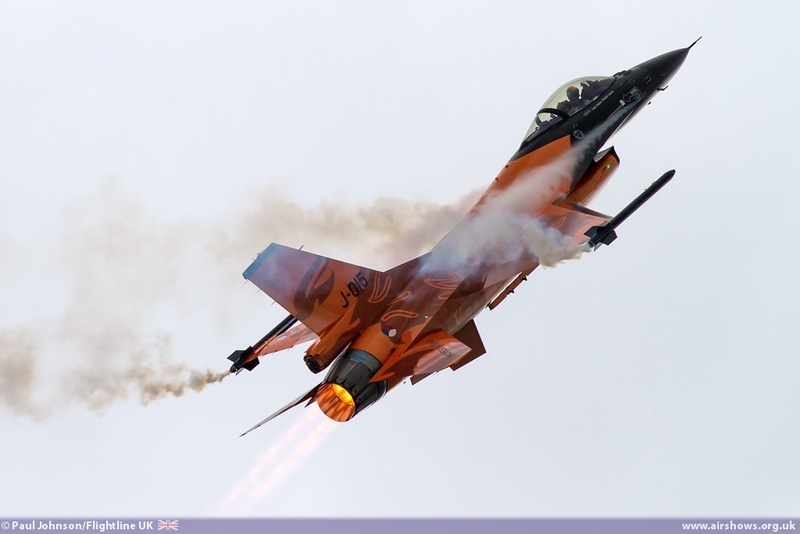 Constructed by Aluminium, it is a much larger machine and certainly not as aerobatic. Instead the team perform a beautiful duo ballet painting elegant shapes in the sky before performing their trademark mirror formation. 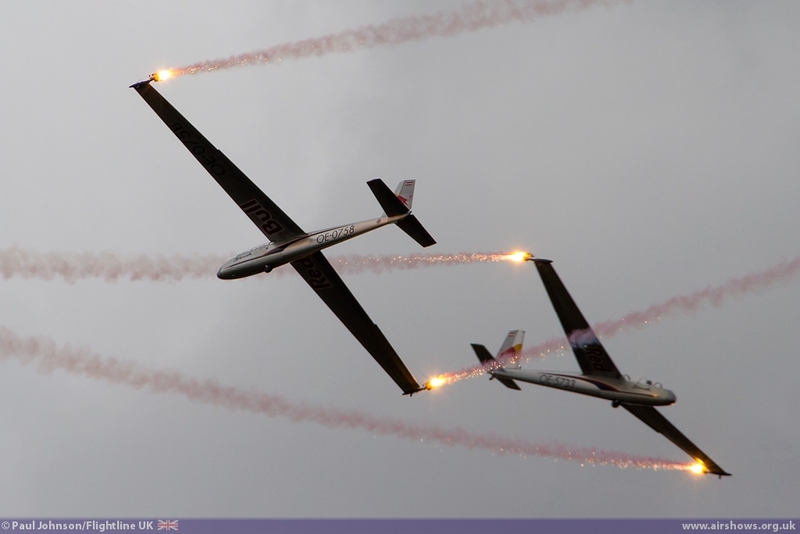 Their display is highlighted by think smoke trails and wingtip flares which illuminate their silver gliders even in the daylight. 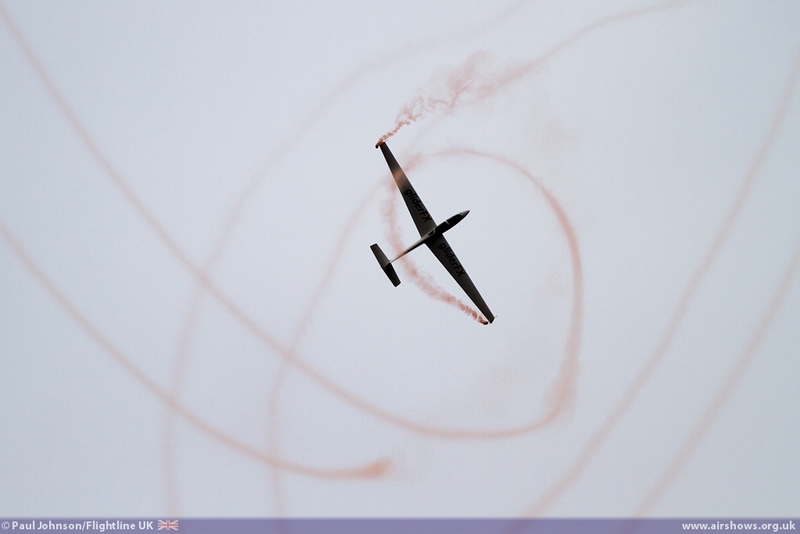 Of course, there was plenty of powered aerobatics. 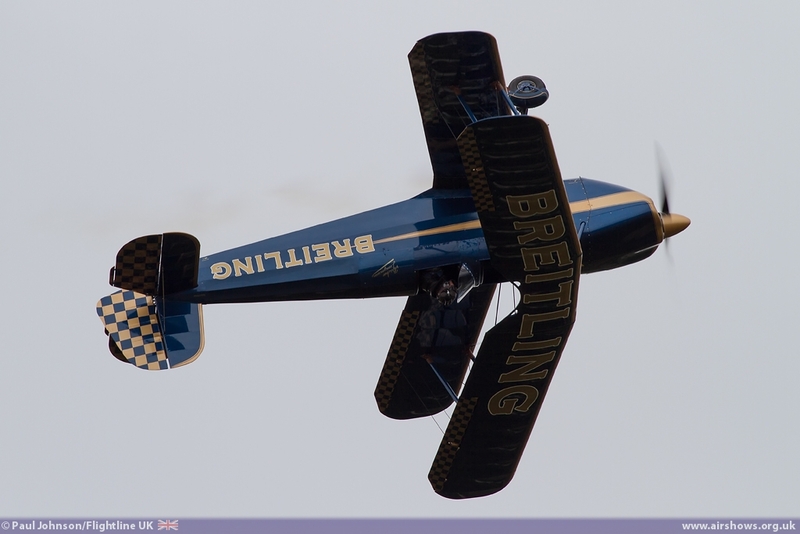 One of the vents main sponsors is Breitling and they had sent two very different acts. 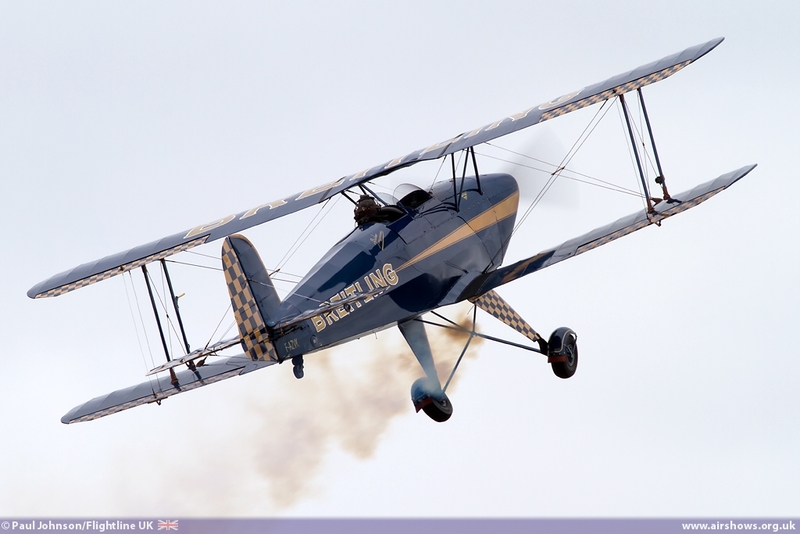 First, from France came the Breitling Bucker Jungmann. 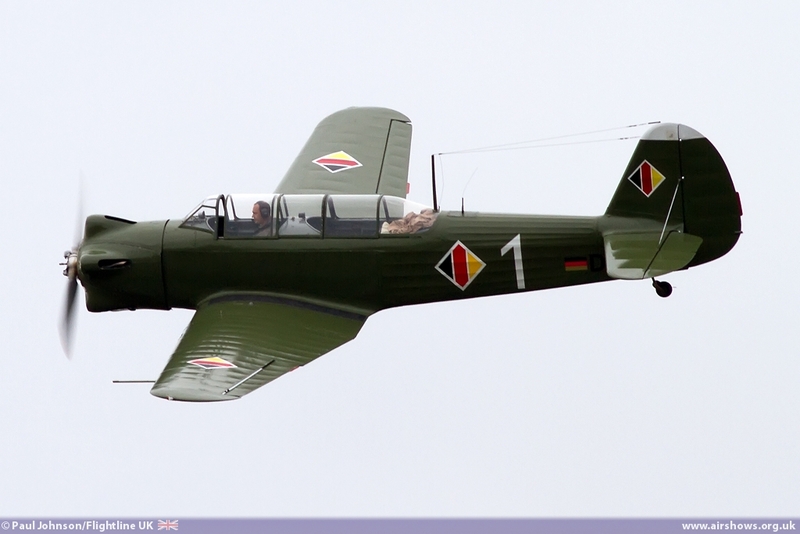 Flown by Bernard Charbonnel, this Jungmann has been converted to take the more modern Lycoming powerplant but is believed to be the 27th of 5000 aircraft produced making it one of the oldest Jungmann airframes still flying. 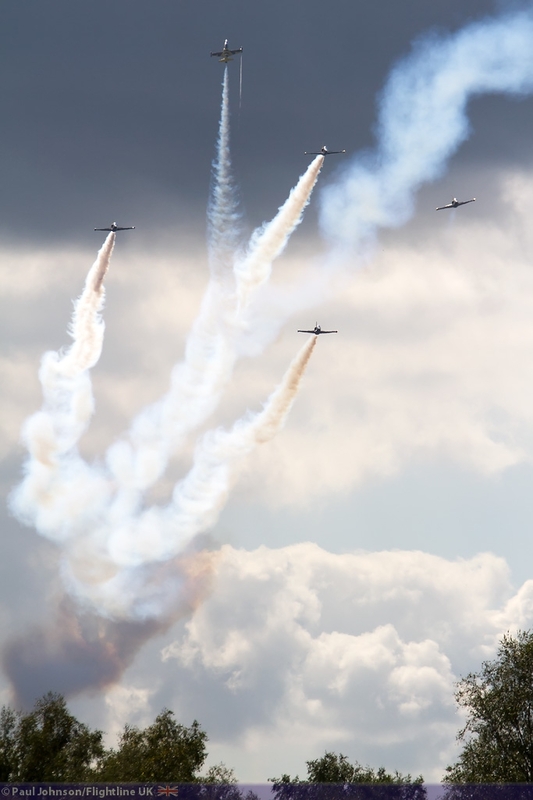 Bernard’s display highlighted the superb aerobatic qualities of the Luftwaffe’s standard training biplane of the Second World War. 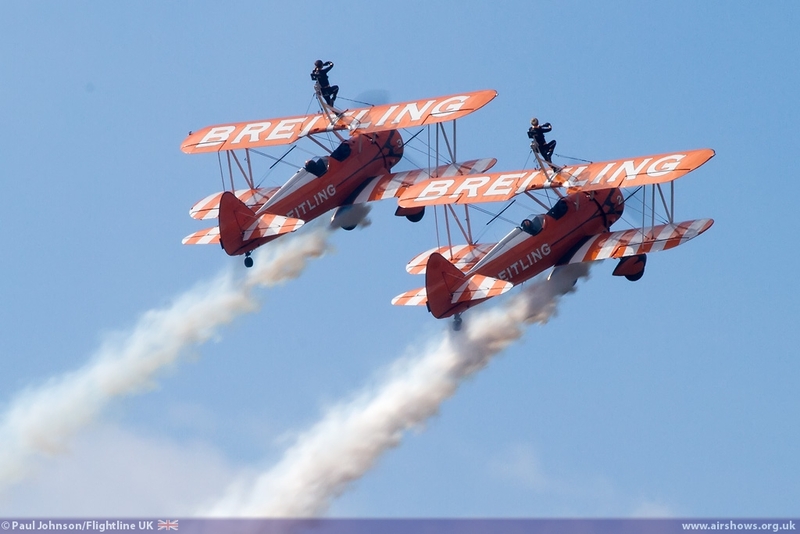 The Breitling Wingwalkers really need no introduction with their wonderful display of Wingwalking and Barnstorming. 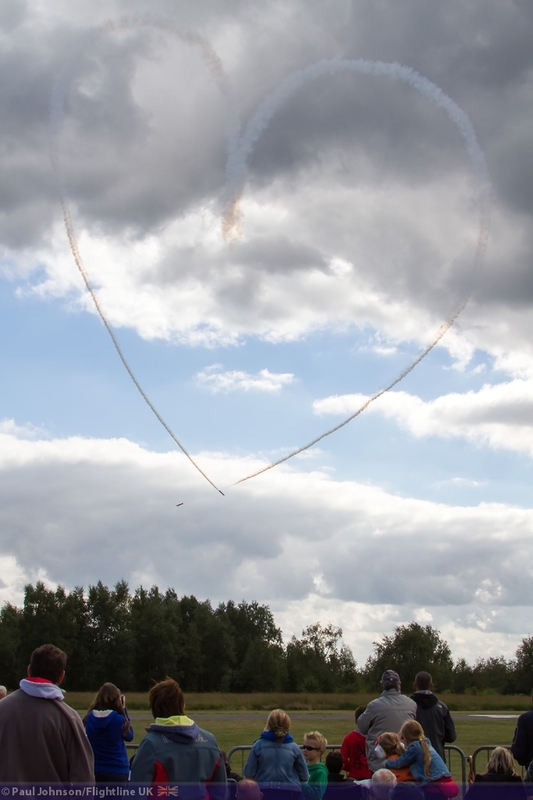 The team also starred on Belgian national television during their stay with one of the country’s most popular TV shows featuring an article on wingwalker Danielle Hughes. 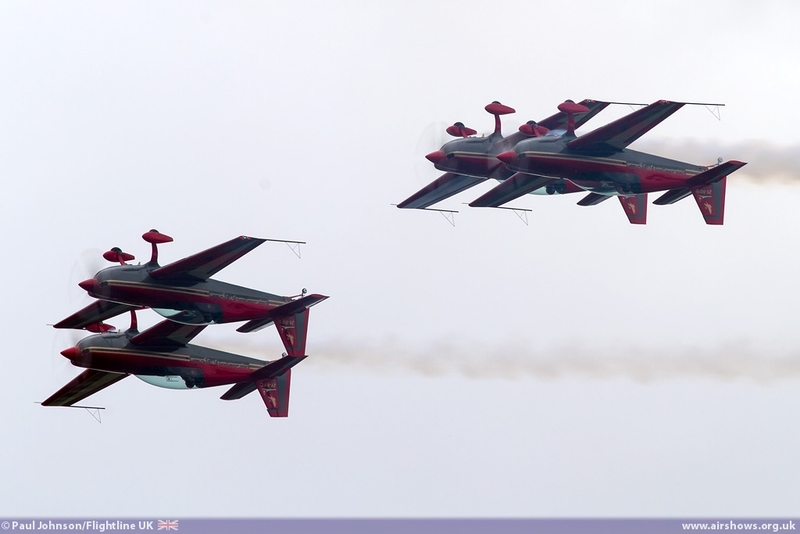 The SWIP Team were another of the large UK contingent of display acts at Sanicole. 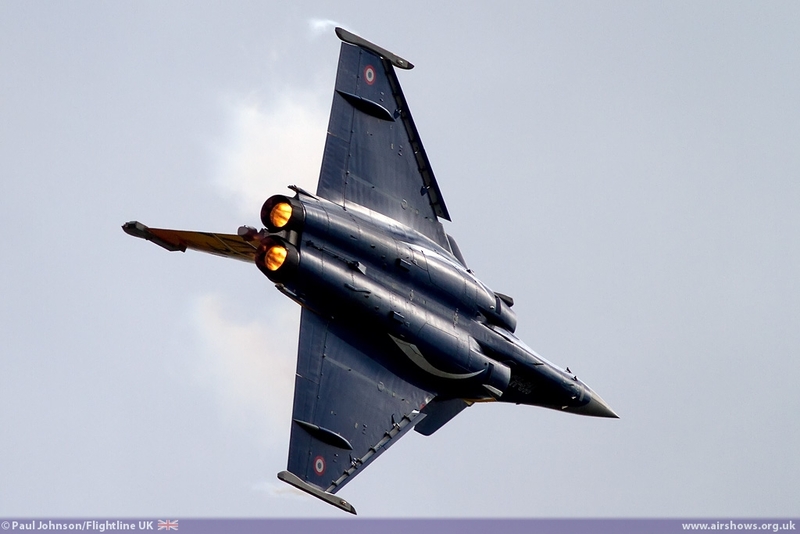 Their daytime display is very different to their evening pyrotechnic display and involved close formation and synchronised aerobatics plus opposition manoeuvres in their relatively low powered Silence SA1100 Twisters. 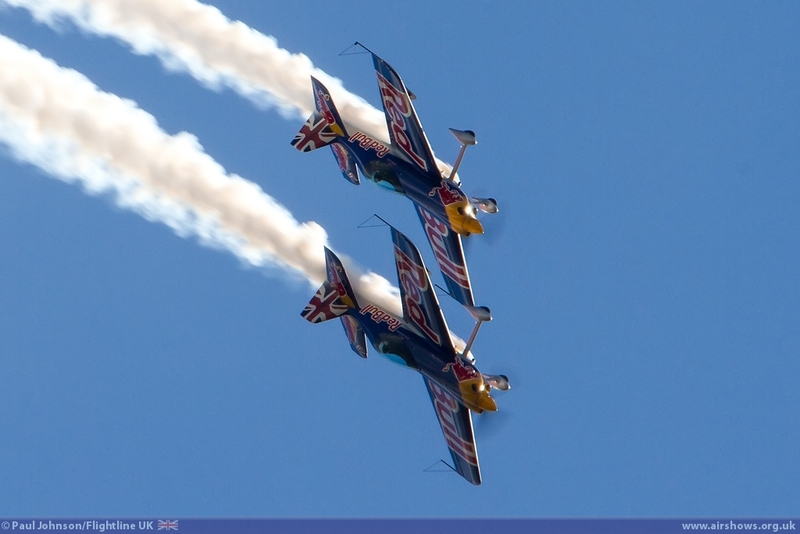 In complete contrast were the Red Bull Matadors flying the Xtreme Air XA41. 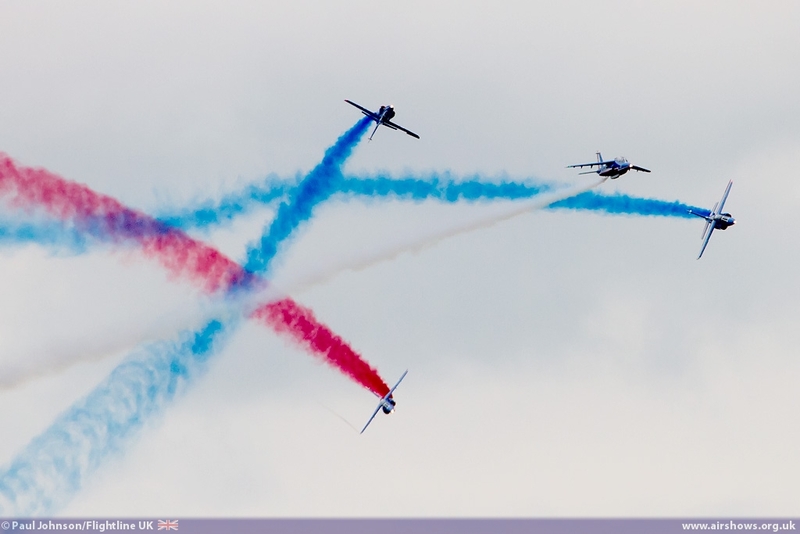 Paul Bonhomme and Steve Jones put on an amazing show of aerobatics in their purposeful machines which certainly caught the eye of the crowd and American commentator Gordon Bowman-Jones who was providing the English language commentary at the show. 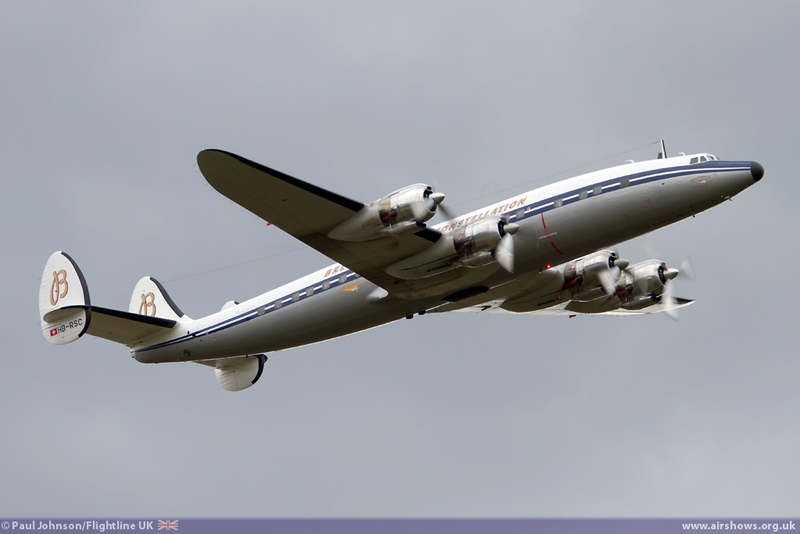 The civilian participation even extended to airliners both historic and new. 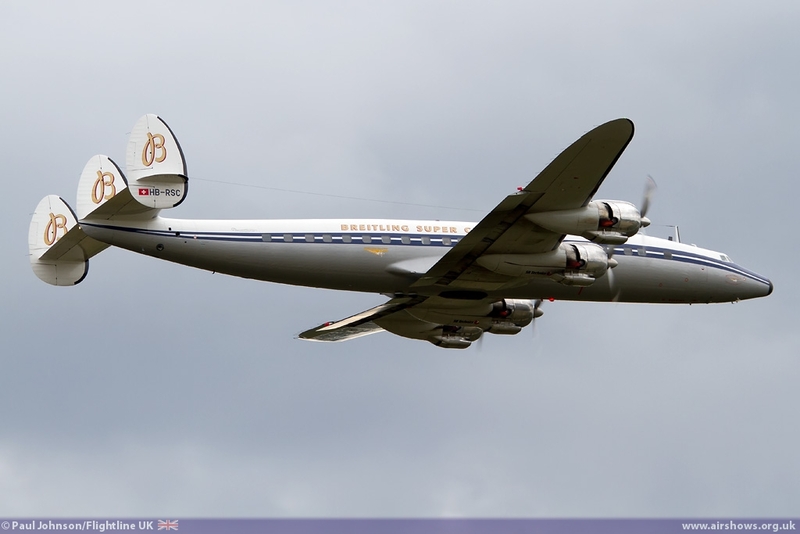 Breitling sent their wonderful Lockheed C-121C Super Constellation for a rare flying appearance from its base in Switzerland. 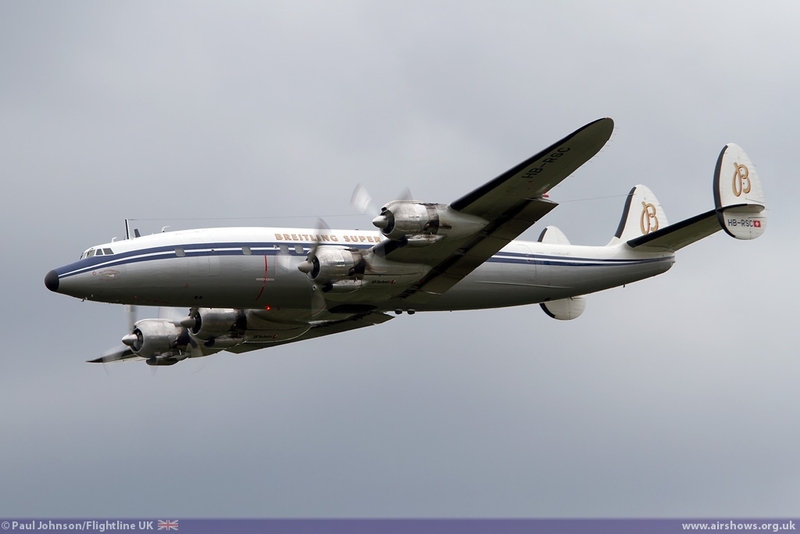 Operating from nearby Kleine Brogel, the charismatic “Connie” made some wonderful sweeping passes with its four radial piston engines roaring. 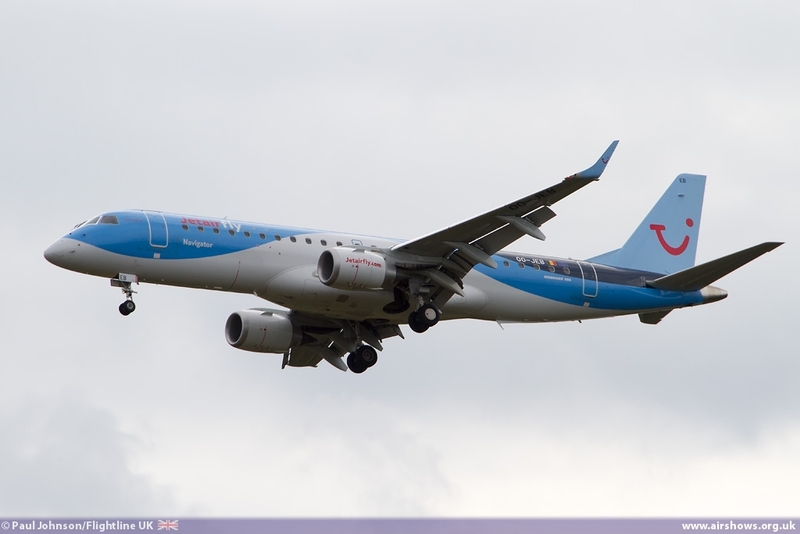 By contrast, the latest generation of airliners to grace Belgian skies were represented by the JetAir Embraer ERJ-190. To their credit, JetAir made more than just a couple of flypasts with a full (and lengthy) display of the new Brazilian airliner presenting a wide range of configuration and profiles to the crowd. 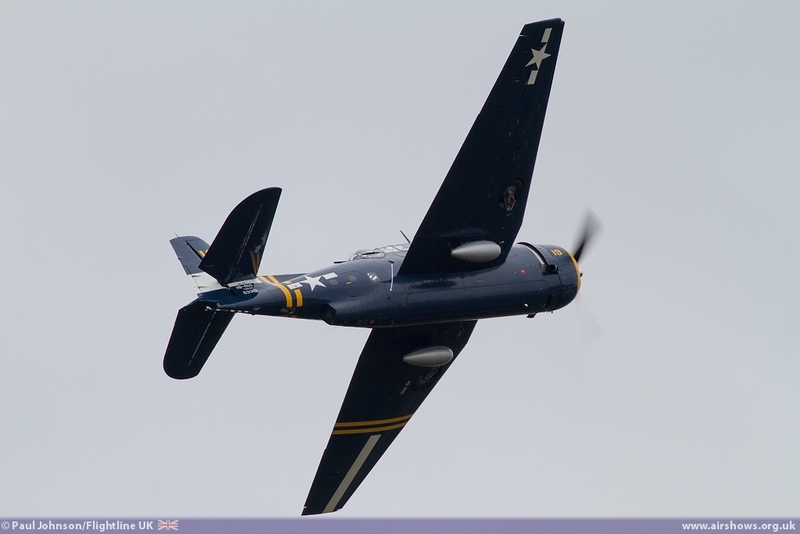 More radial action came from a pair of American Naval Warbirds. 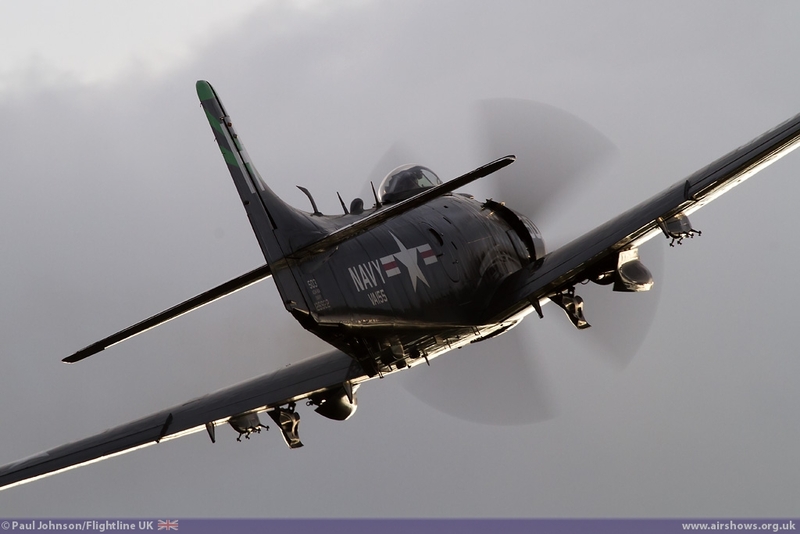 John Beattie gave a great account of Kennet Aviation Douglas AD-4N Skyraider which shares the same basic engine type as the Constellation and the same amazing thirst for engine oil! 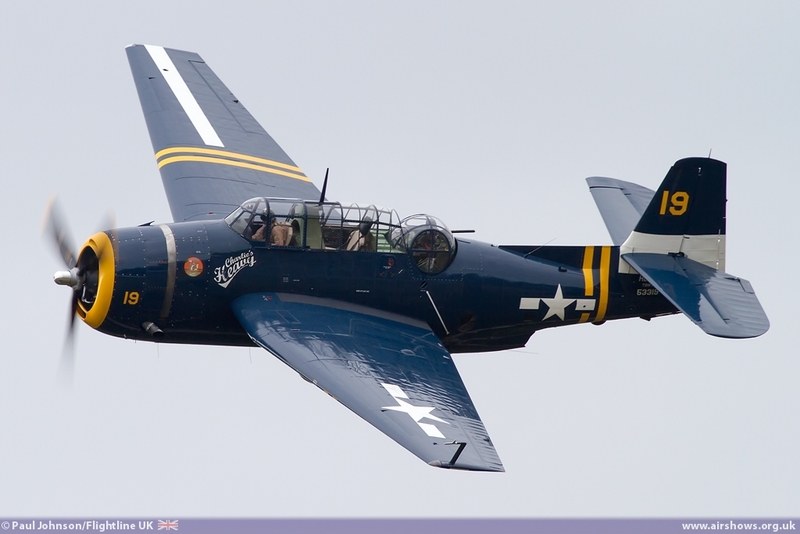 Association “Charlie’s Heavy” showed off their wonderful Grumman TBM-3R Avenger. 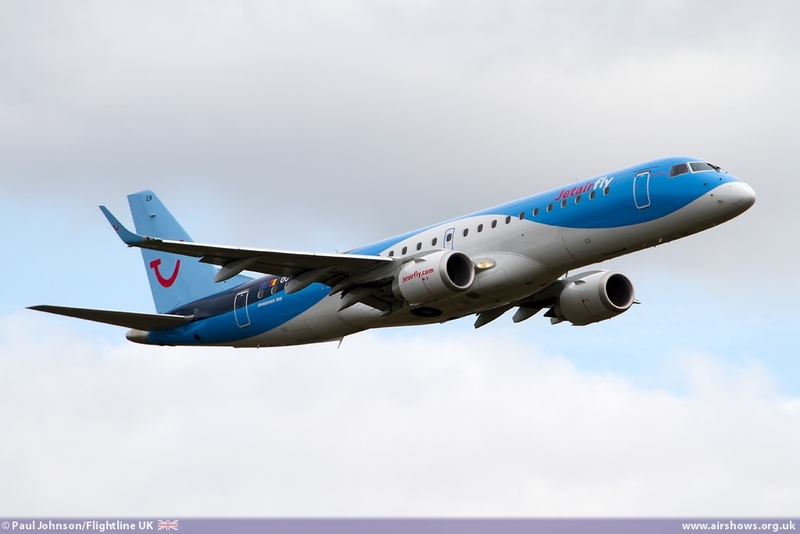 This is the example is actually the example formerly based in the UK and owned by Tony Haig-Thomas. 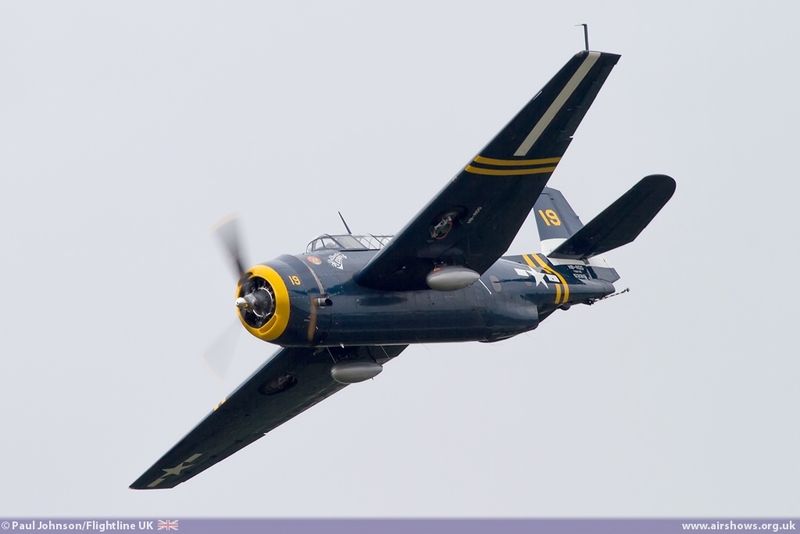 It has however been returned to the configuration of a Torpedo Bomber complete with rear turret and a replica Torpedo within its internal weapons bay. 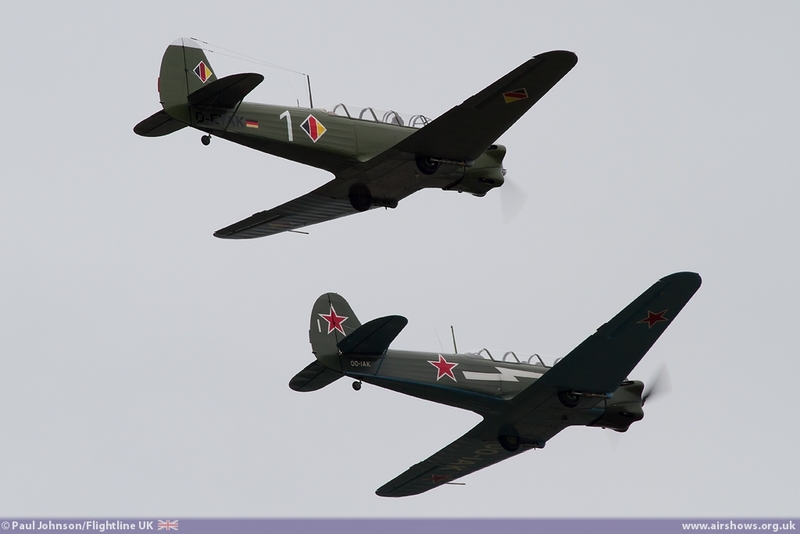 Amongst the home-grown acts were the Max Team who presented a lovely pair of Yakovlev Yak-18s wearing Soviet and East German Air Force colours. 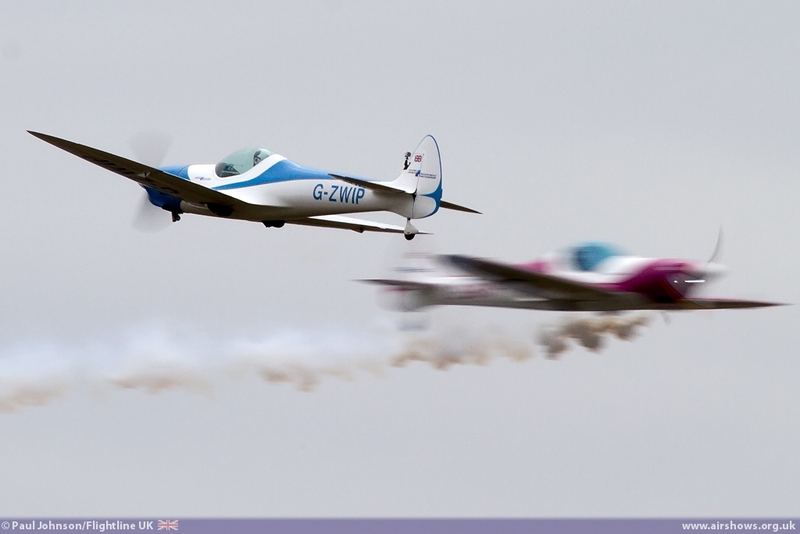 While outwardly similar to the numerous Yak-52, these aircraft are not nearly as powerful or aerobatic. 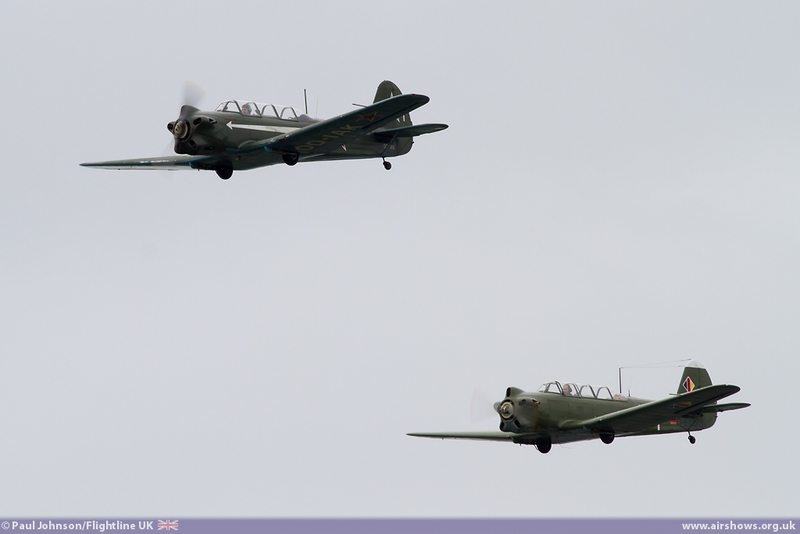 However the Max Team still put on a pleasing routine of formation and solo passes showing off this classic soviet training aircraft from the immediate post-war years. 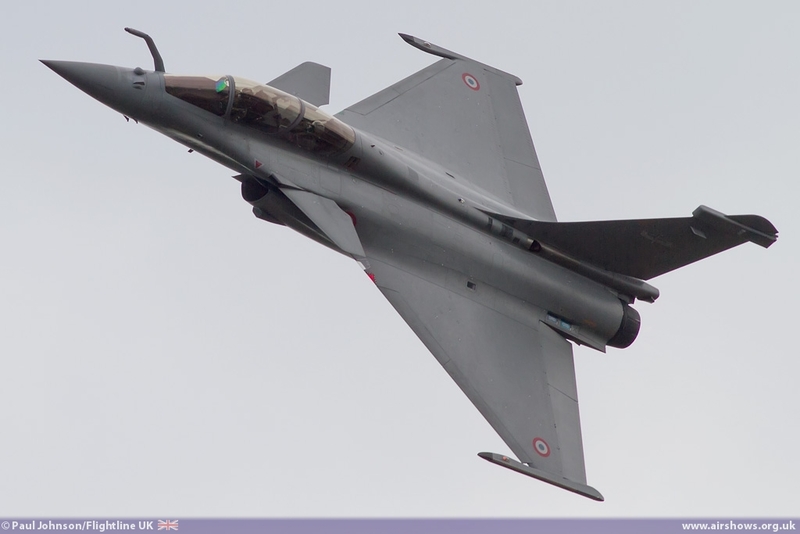 Further historic aviation came from the jet age. 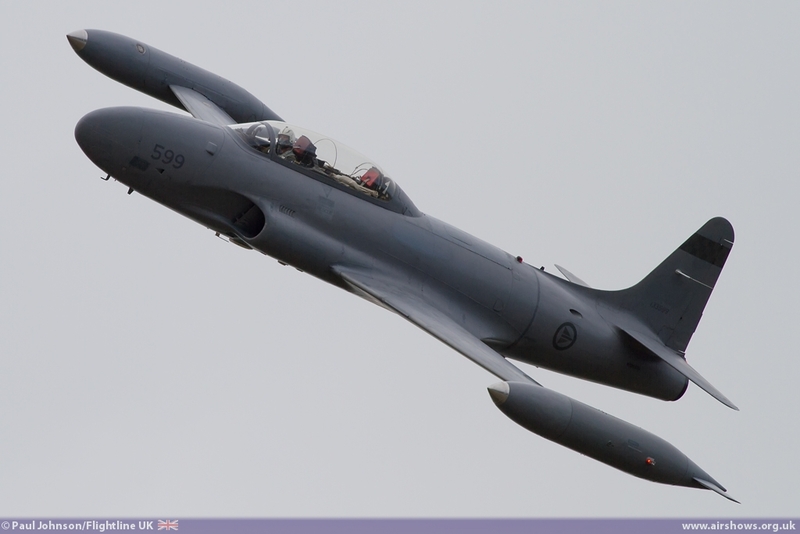 One of the last minute additions to the flying programme as a result of the absence of the Flying Bulls was the Royal Norwegian Air Force Historic Squadron’s Canadair CT-133 Silver Star. 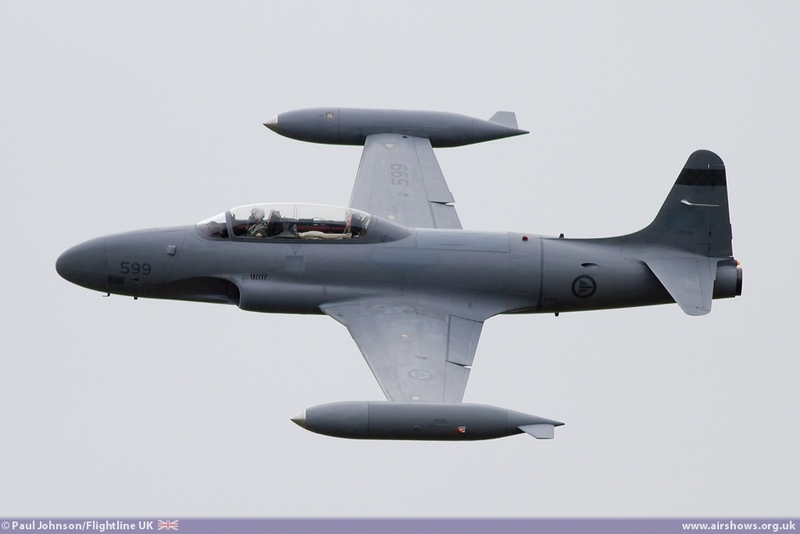 T-33/CT-133s were a common sight across Europe as they were one of the few early Jet Trainers. 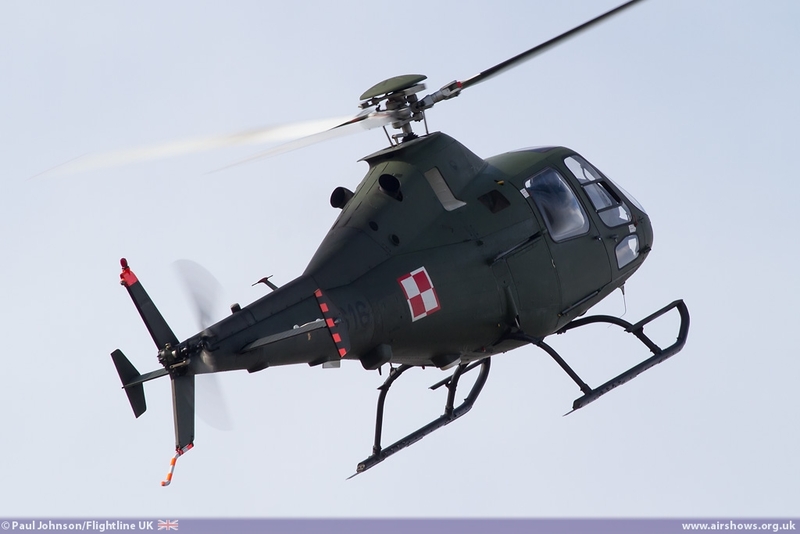 The Norwegian example is actually a Canadian Air Force example which had been used until relatively recently and still wears its overall light grey scheme albeit with Norwegian roundels. 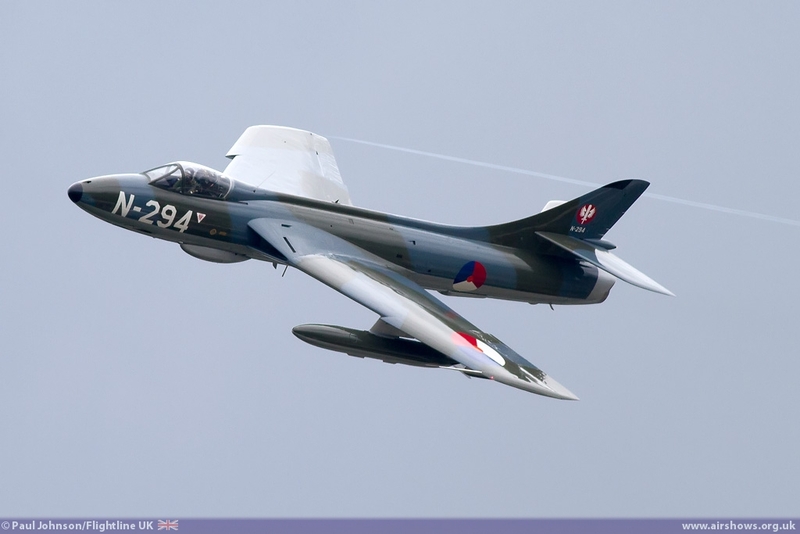 While the T-33 is a relatively rare sight in Europe today, the same cannot be said of the Hawker Hunter. 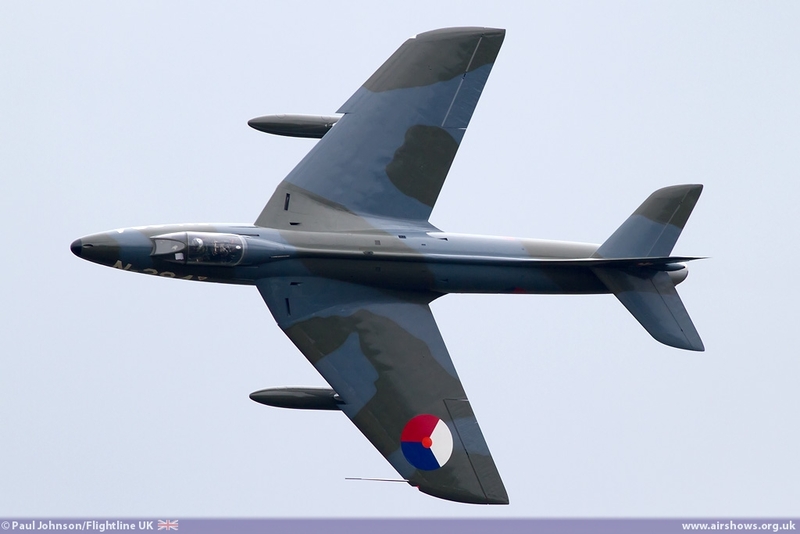 However, the Dutch Hawker Hunter Foundation’s Hawker Hunter F6 is one of the few single seat examples left flying and one of the very few that makes the true distinctive “blue note” as it makes high speed passes. 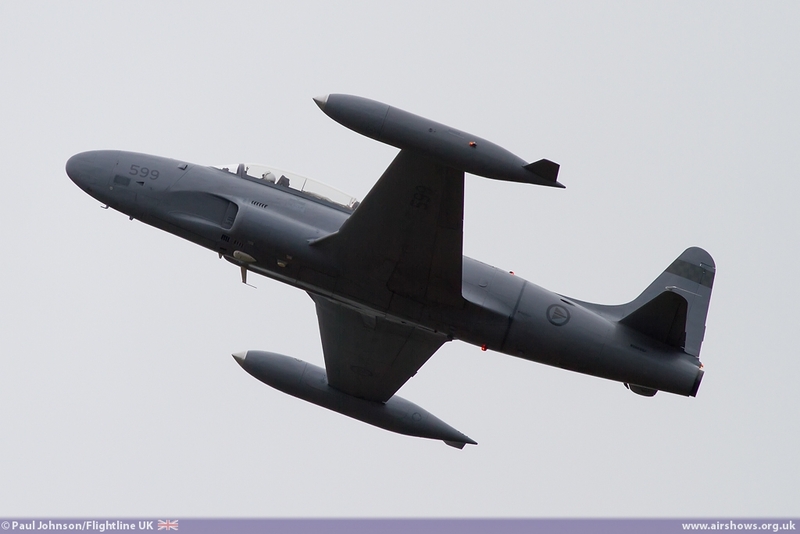 Pilot Patrick Tuit put on a superb display in the aircraft showing off the great lines of the Hunter to the crowd very well. 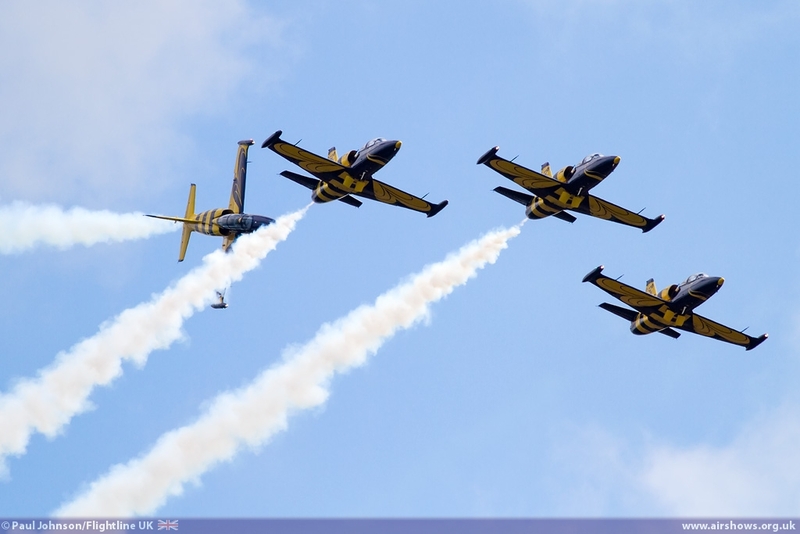 Further civilian operated jets came from the Latvian Baltic Bees Jet Team with their L-39C Albatross jets, the second of the late additions to the Sunday flying programme. 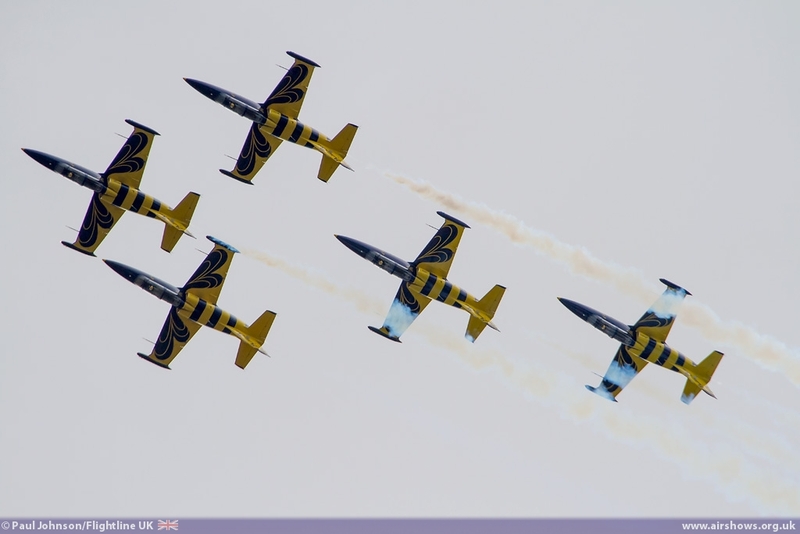 The team were originally just scheduled to appear during the Sunset Airshow on the Friday but Sunday’s better weather permitted the team to perform their full display routine. 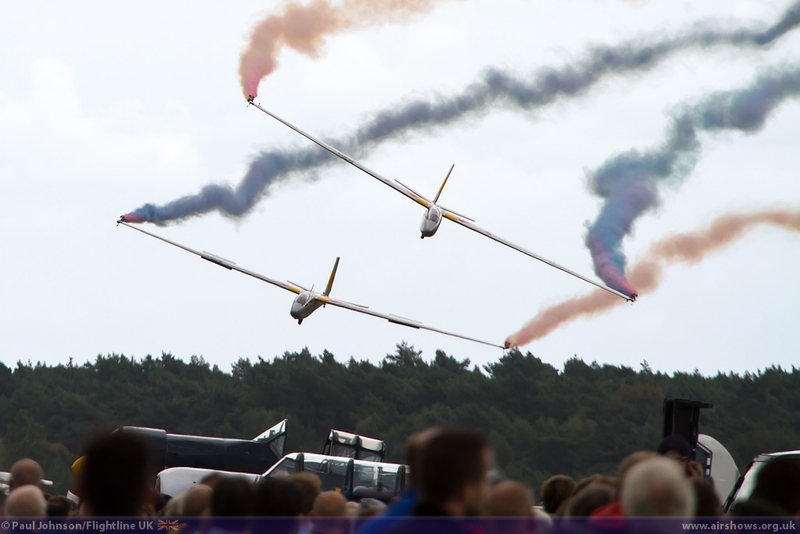 The team’s display just keeps getting better each year and is now fur more dynamic and tighter to the display venue. 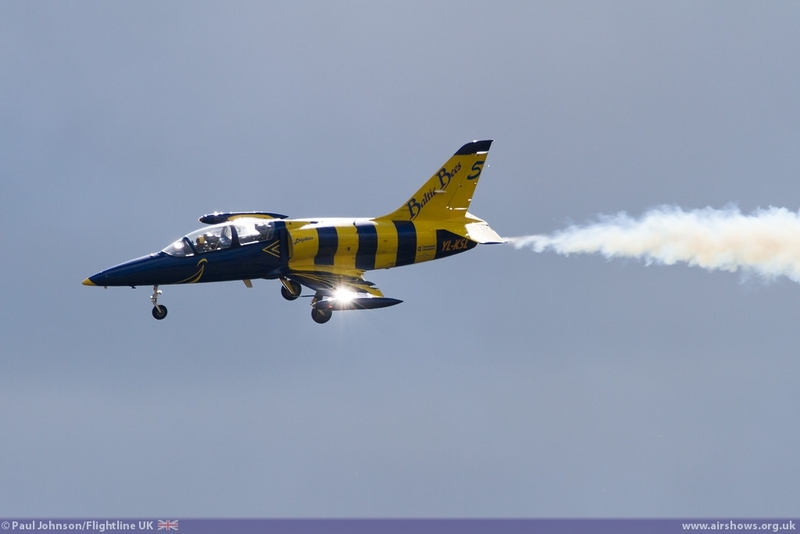 The solo pilot is a bit of a star not only performing a tail-slide in his L-39C Albatross, but also a lomcevak! 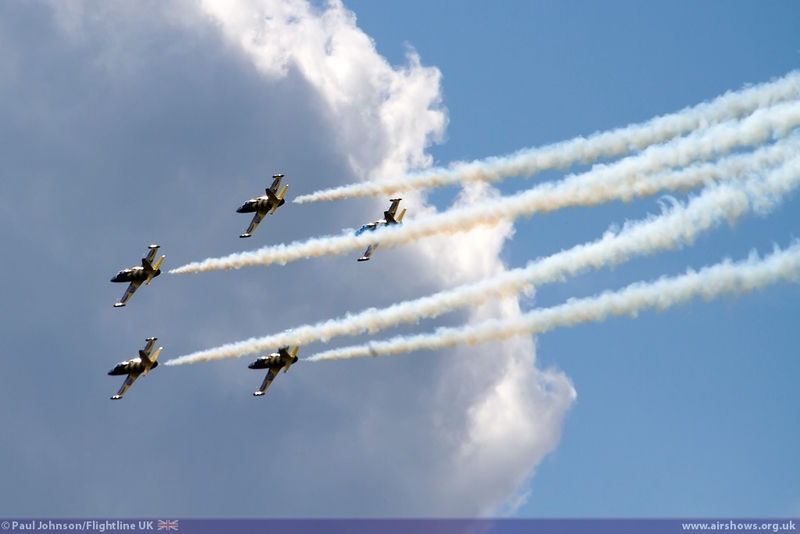 The Baltic Bees were just one of a number of displays teams in the flying. 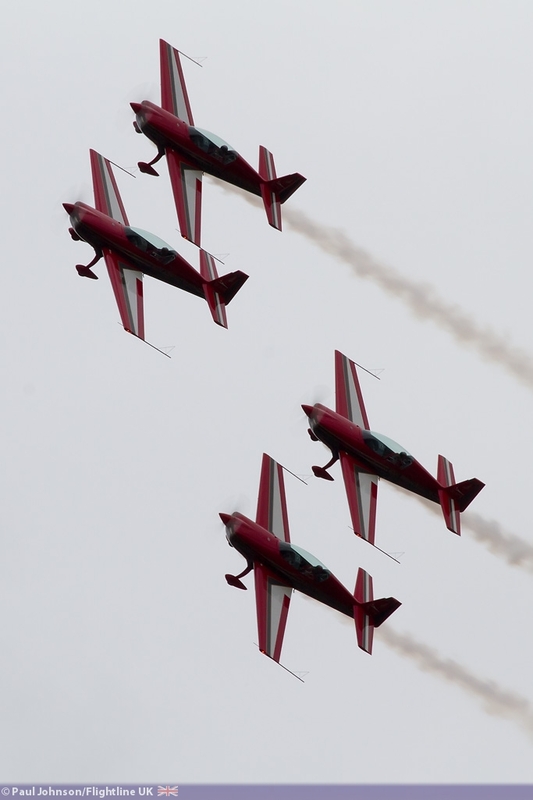 The only display item from outside Europe this year were the Royal Jordanian Falcons with their four Extra 300L aircraft. 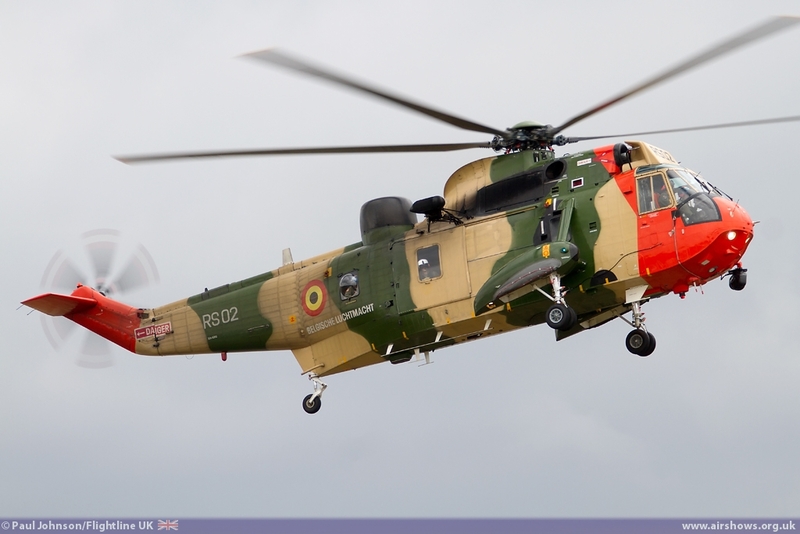 Sanicole was the last stop on their European tour and their aircraft were dismantled following the event and taken back to Jordan aboard C-130Hs from the countries Air Force. 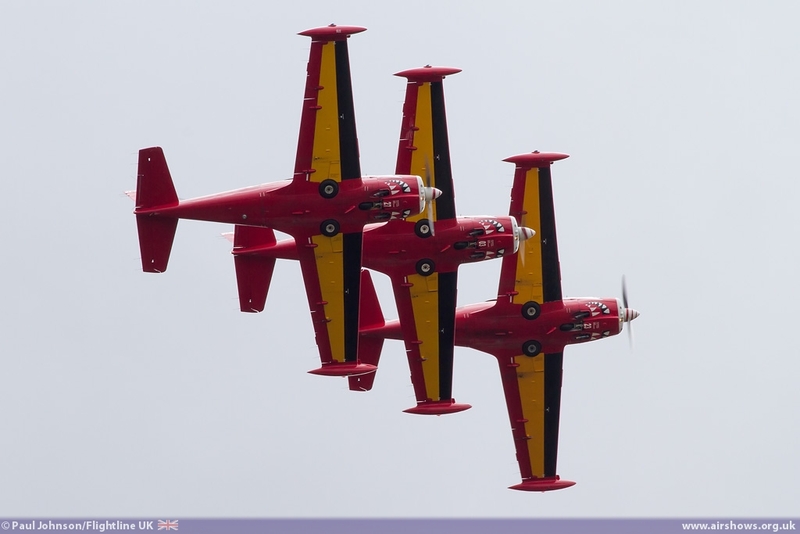 The Belgian Air Force Red Devils were the “home” national display team flying their SIAI-Marchetti SF260s. This incarnation of the famous Red Devils is a relatively young team but they put on a very polished routine in their scarlet trainers. 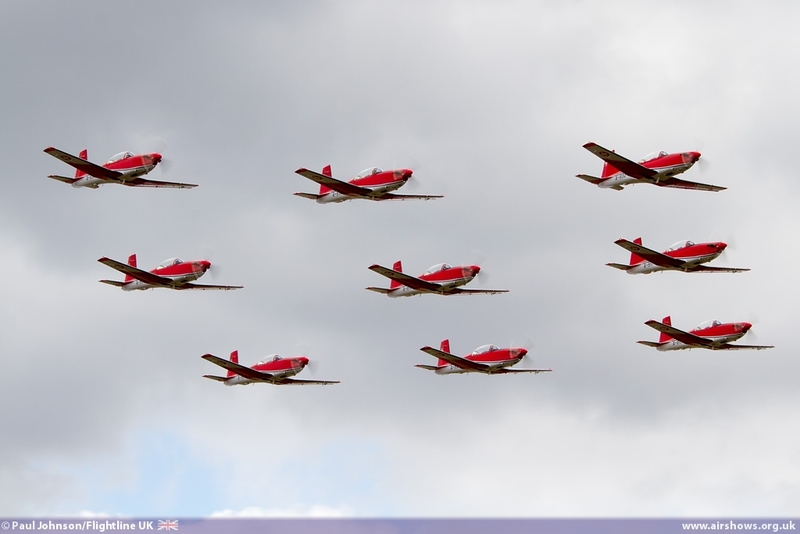 The Swiss Air Force PC-7 Team was back at Sanicole after a six year absence. 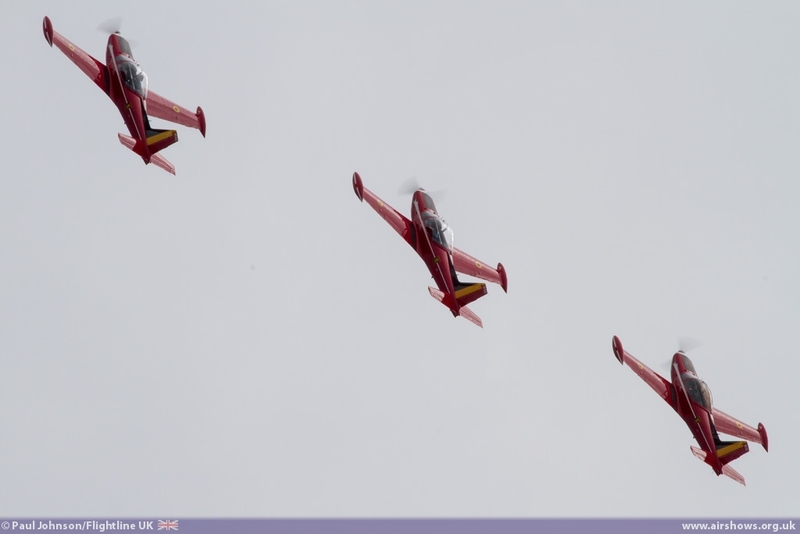 The Team, flying nine Pilatus NCPC-7 Turbotrainers, were a relatively late addition to the Sanicole line-up replacing the F/A-18C Hornet Solo display which was cancelled from all events in the summer. 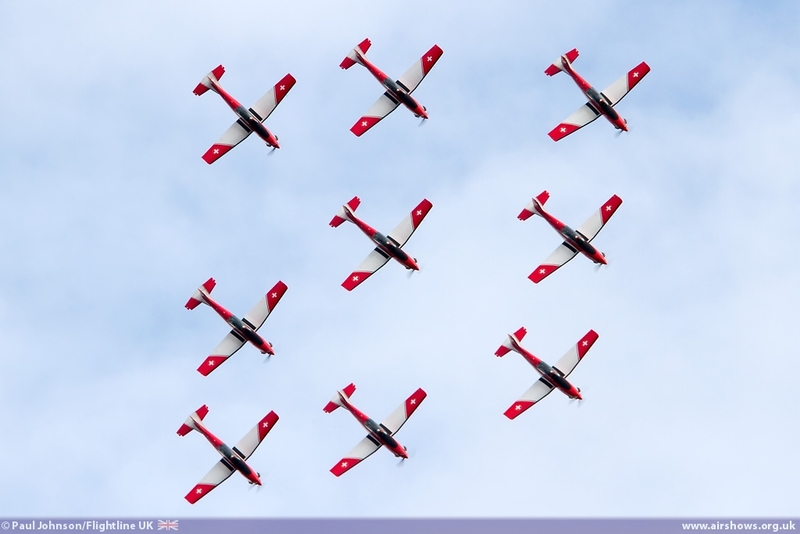 While the team lack smoke, the agility of the PC-7 does allow the team to put on a very tight routine and as you would expect from the Swiss, it is incredibly precise! 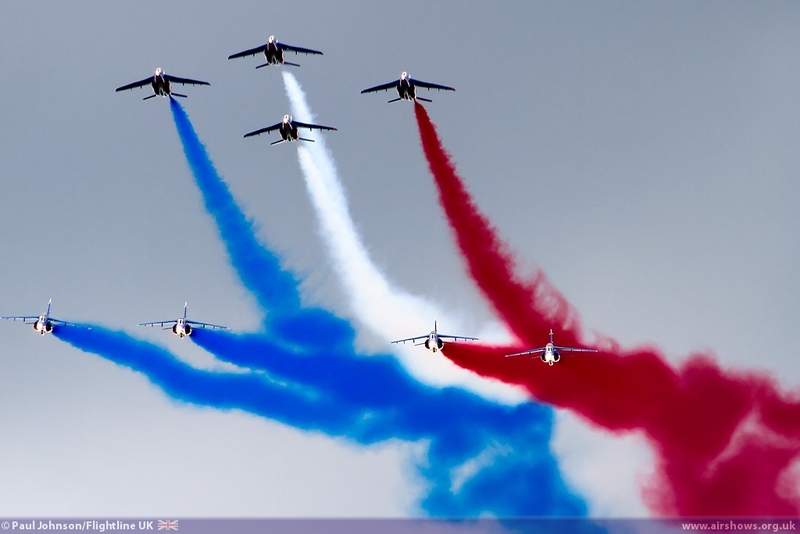 La Patrouille de France was the headline act of the International Sanicole Airshow. 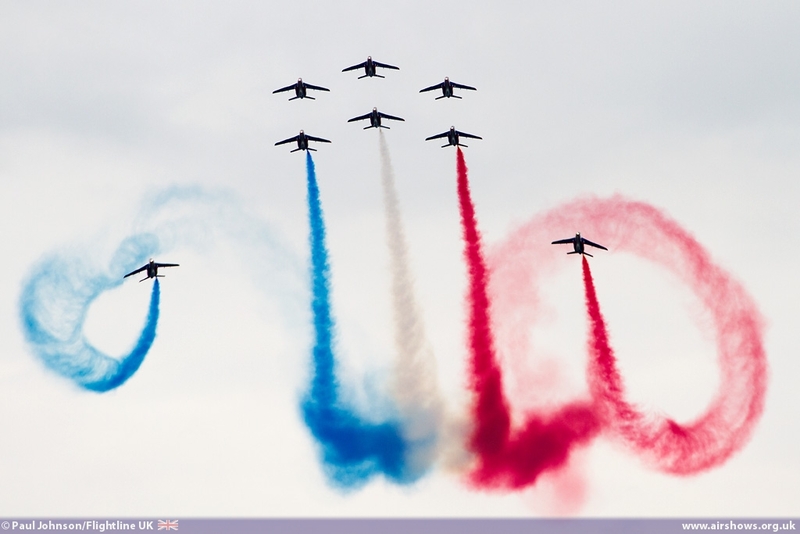 2013 has seen the team mark its 60th Anniversary starting with La Ferte Alais and their own 60th Anniversary Show at Salon de Provence in May. 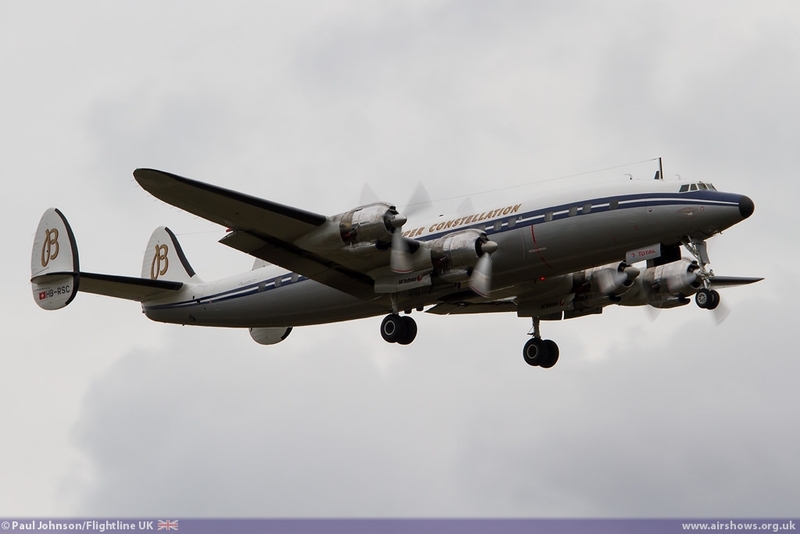 Since then they have appeared throughout Europe appearing at a number of major events. 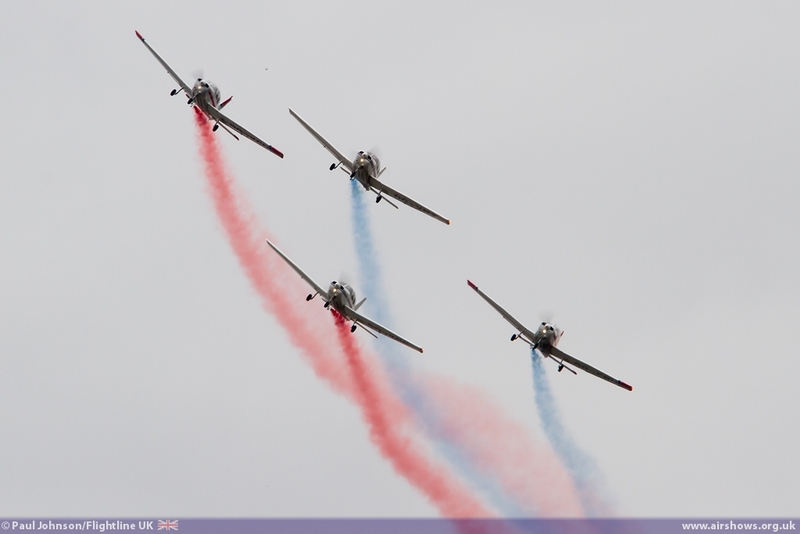 As always, their display was a superb mix of close formation aerobatic and stunning solo and synchronised flying painting the French tricolour across the grey Belgian skies. 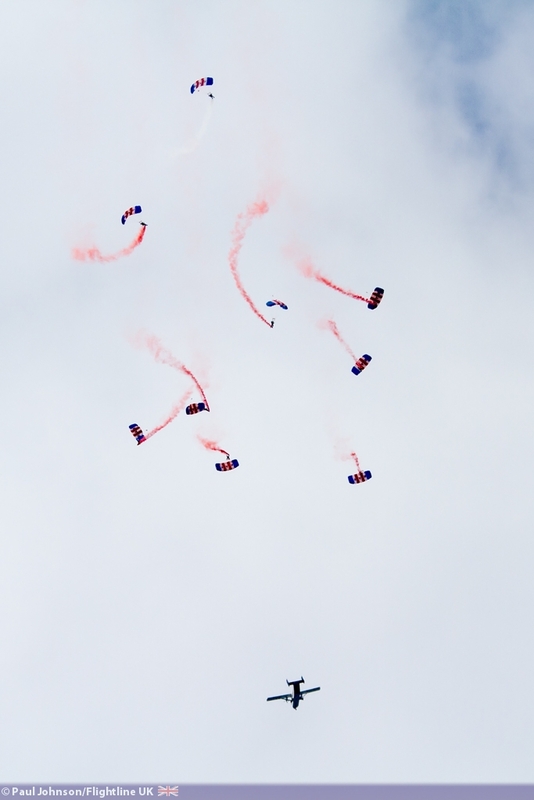 Parachute display teams always feature high in any Sanicole programme and 2013 saw the Royal Air Force Falcons Parachute Display take the honours jumping from a Shorts Skyvan. 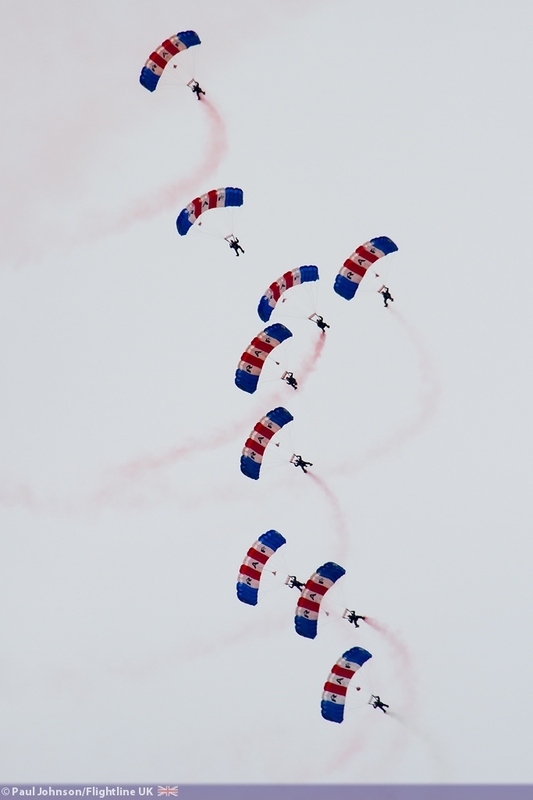 The Falcons were the only representatives of the UK military at this year’s show and their close stack formation certainly got the attention of the crowd. 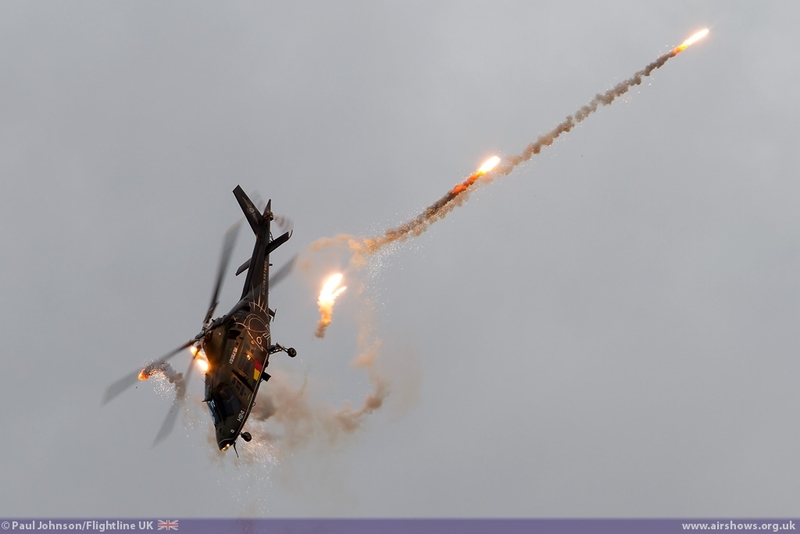 There was plenty of modern military action in the flying display too. 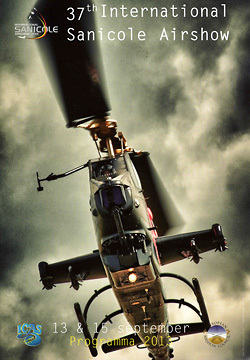 Helicopters play an important in the flying programme as they are the only big military assets capable of operating from Sanicole. 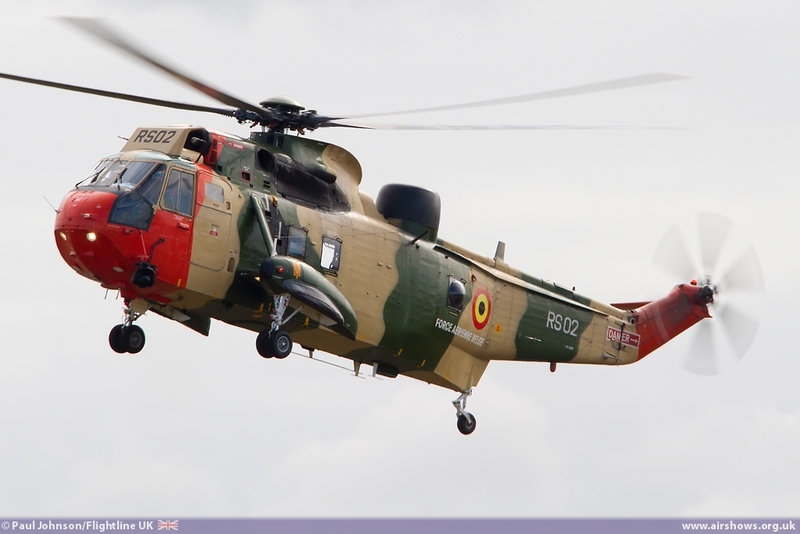 The Belgians sent their flare-firing A109BA Demo and an increasingly rare role demonstration from the Westland Sea King Mk.48 from 40 Squadron based the Koksijde. 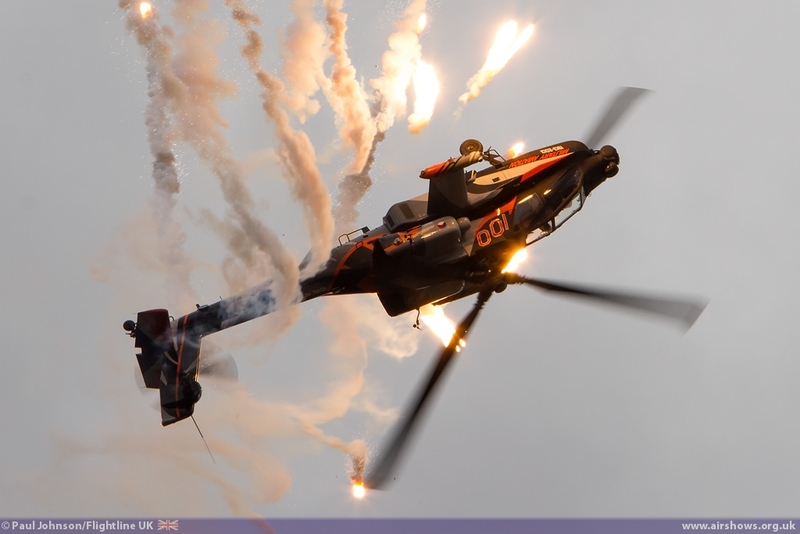 Another regular at Sancole is the Royal Netherlands Air Force AH-64D Apache Demo team which like the A109BA makes full use of flares during its routine. 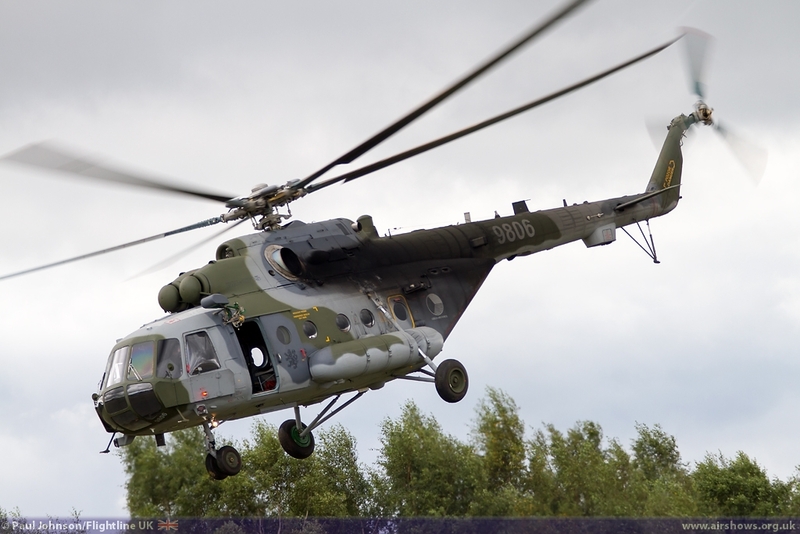 It was however eastern European rotary hardware that stole the show. 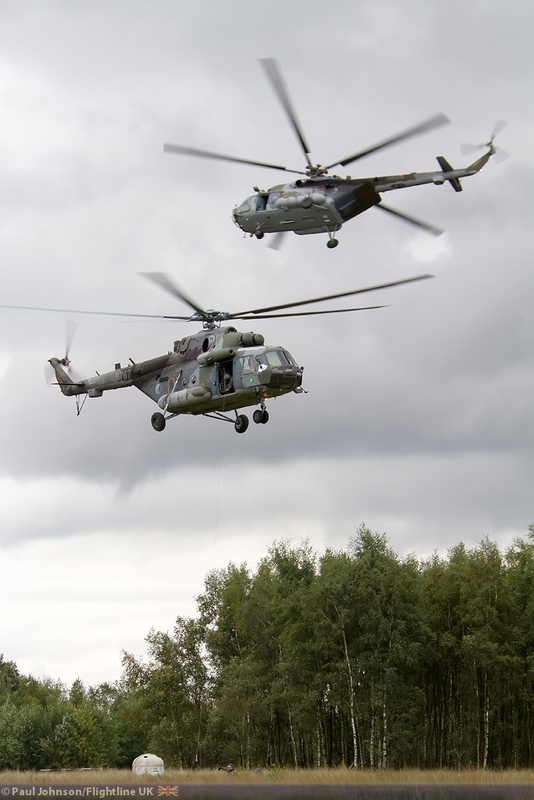 The Polish Air Force were making their Sanicole debut and sent a pair of PZL SW-4 Puszczyk (Tawny Owl), one of which provided a solo display. 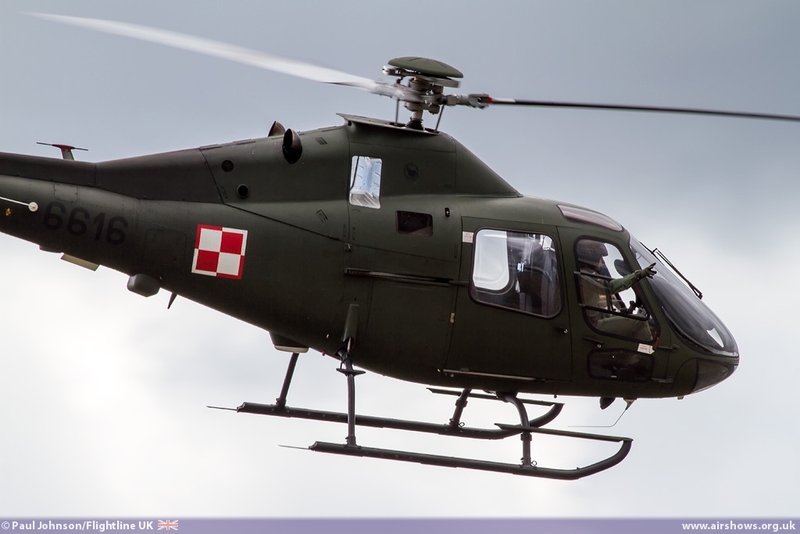 Originally designed in the 1980’s, the aircraft was substantially redesigned following the fall of the Iron Curtain to use a western Allison engine and first flew in 1996 and entered service in 2002 with the Polish Air Force and currently performs a variety of missions including border patrol and liaison. 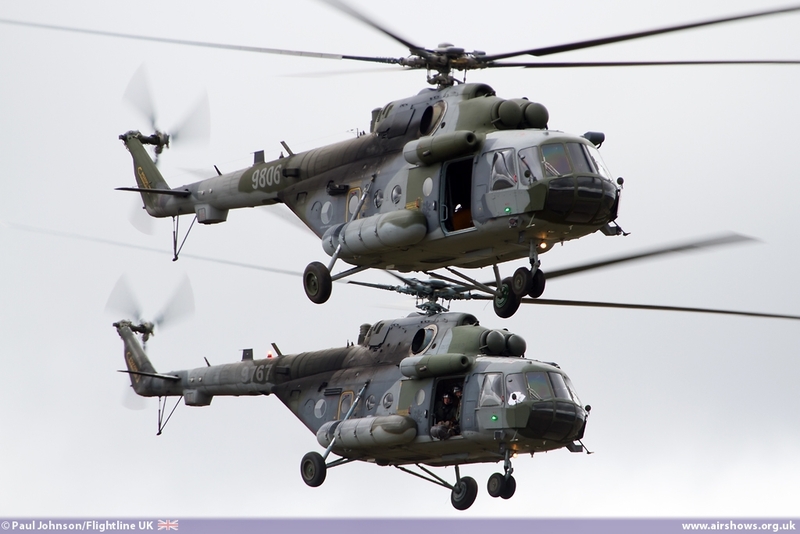 However, quite literally dominating the airfield was a pair of Czech Air Force Mil Mi-171 ‘Hip’ transport helicopters. 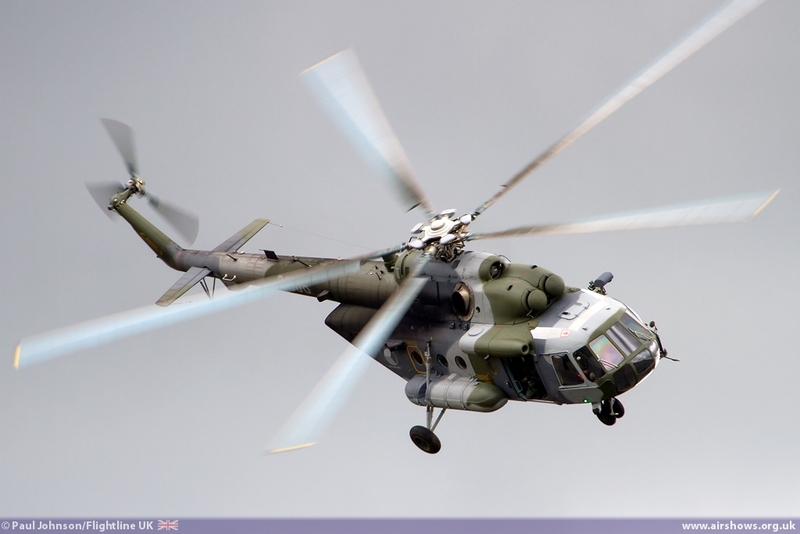 The Mi-171 is an export development of the ubiquitous Mi-8 and entered service with the Czechs in 2005. The pair at Sanicole were part of a batch of eight that were fitted with a loading ramp rather than the normal clam-shell doors which allow Jeep-type vehicles. 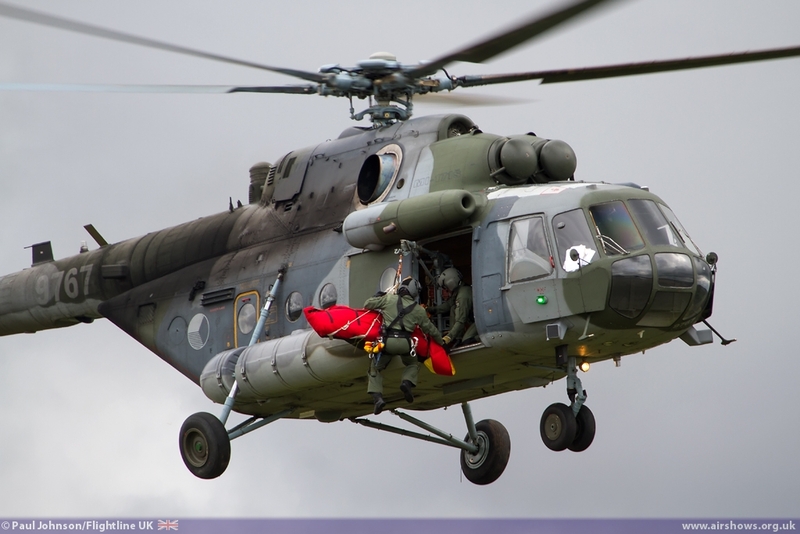 The pair performed a Combat Search and Rescue role demonstration which started with a rather unlucky dummy (downed pilot) being thrown from the helicopters! 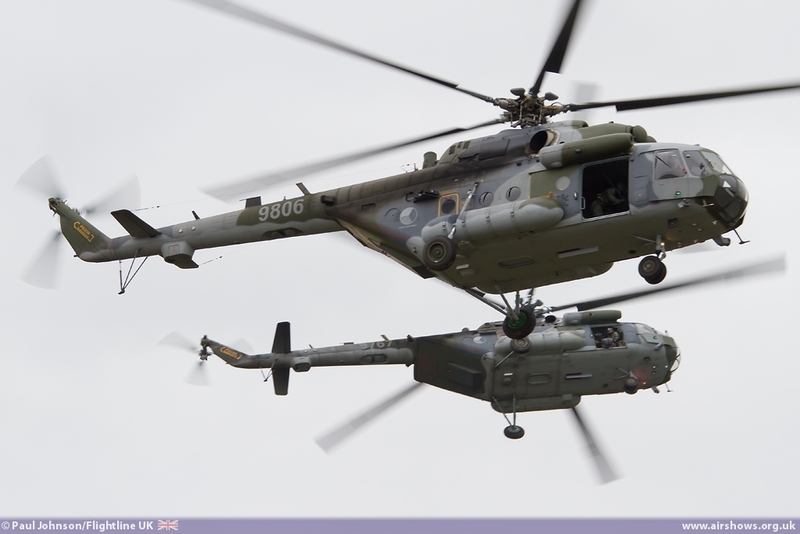 Subsequently the helicopters dropped a couple of Special Forces personnel to locate the “downed pilot” with one helicopter providing fire support. 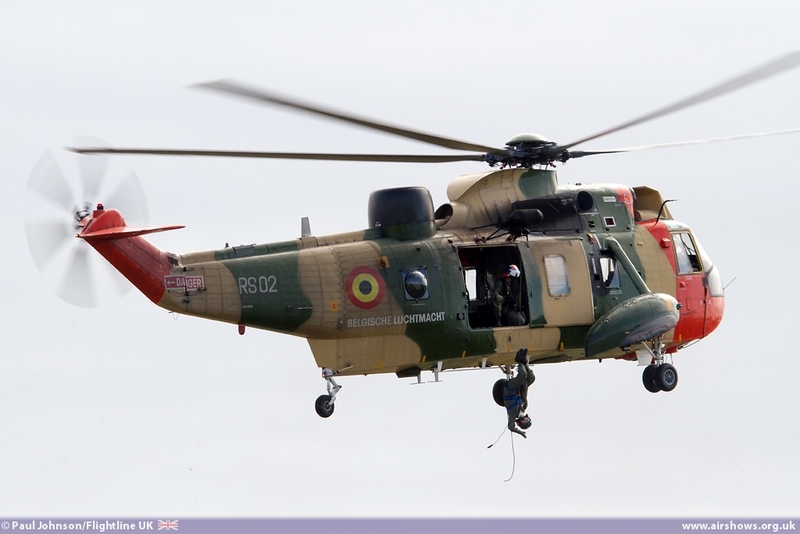 Once the Special Forces and downed pilot had been located the helicopters worked together to draw fire away from the extraction point and recover the casualty and rescue party. 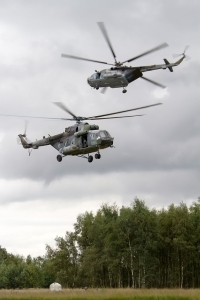 It was certainly very impressive seeing such large helicopters manoeuvring close up and we hope the display can be seen more widely next year. 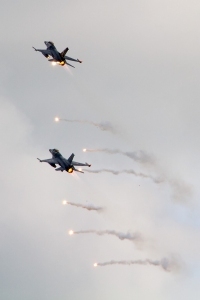 There was plenty of fast jet action too. 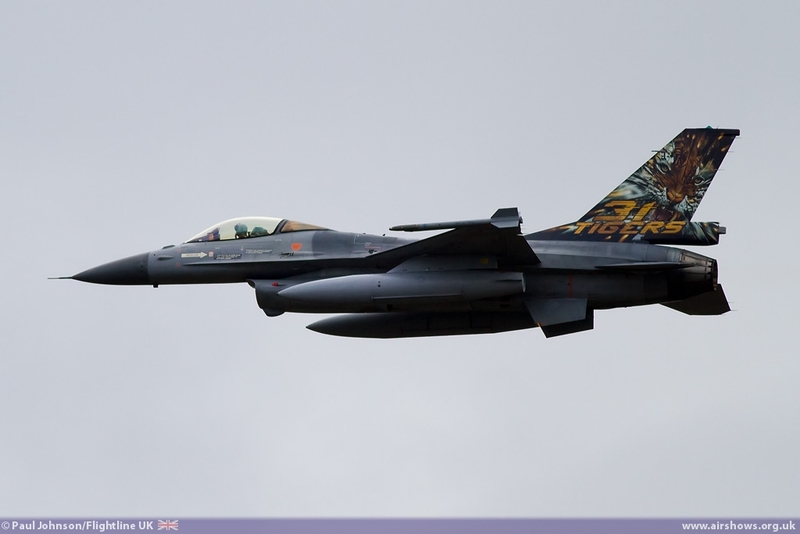 Kliene Brogel is home to 31 “Tiger “ Squadron and its F-16AM Fighting Falcons. 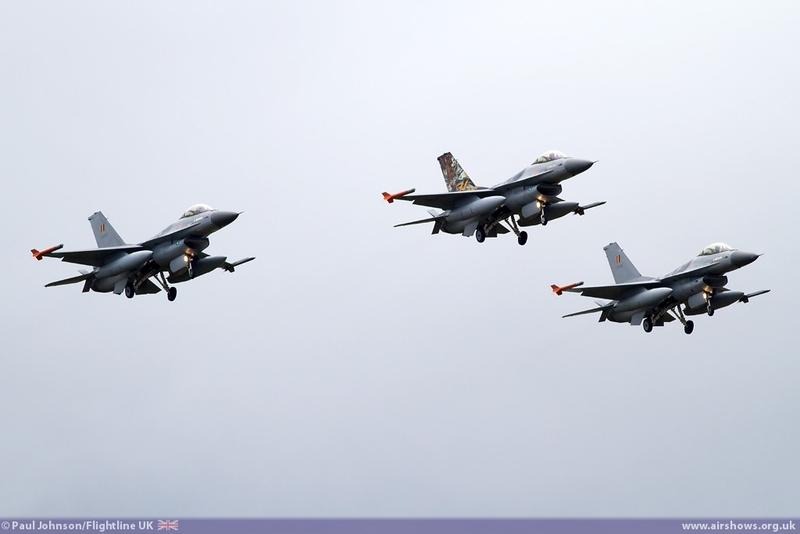 They provide one of the traditional displays at Sanicole under their nickname the “Thundertigers” which presented a four-ship of three F-16AM single seaters and a F-16BM two seater performing a mixture of formation passes and role demonstration.. 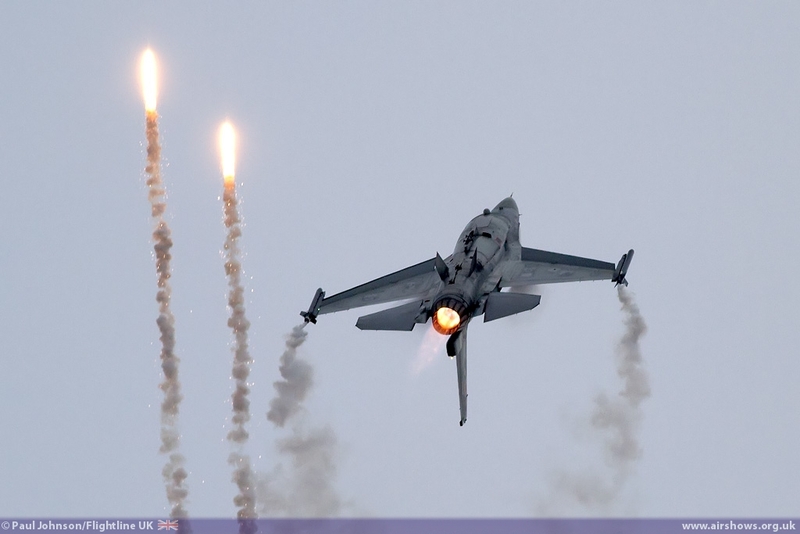 The finale to their show was a spectacular high speed formation departure firing fiares as they departed to the east. 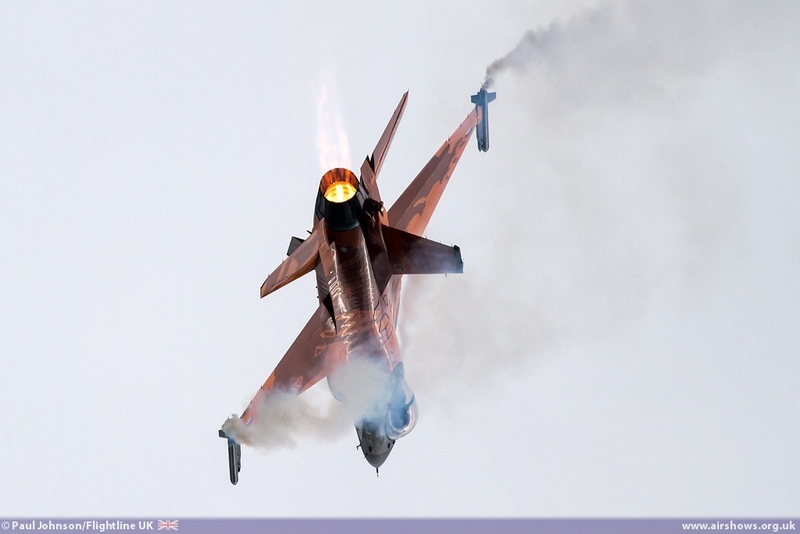 The Royal Netherlands Air Force sent its F-16AM Fighting Falcon solo display over the border to display at Sanicole. 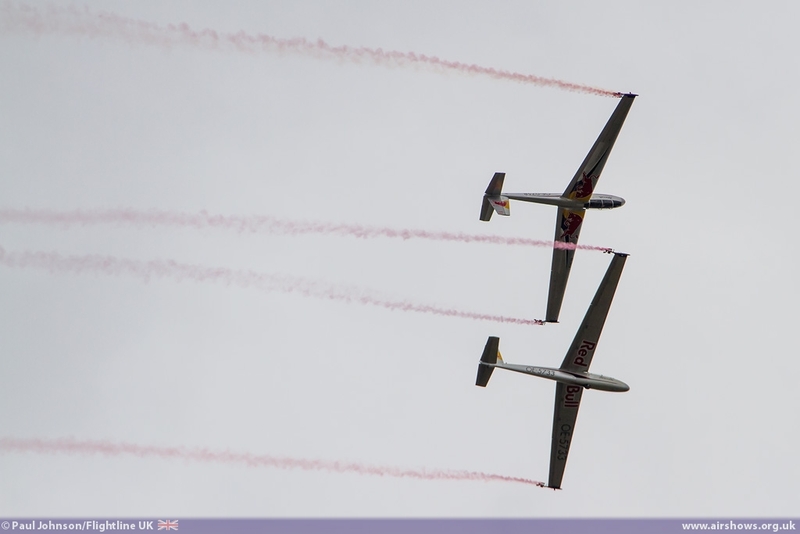 With the overcast, “Stitch” performed his rolling show which certainly kept the big jet close to the crowdline throughout. 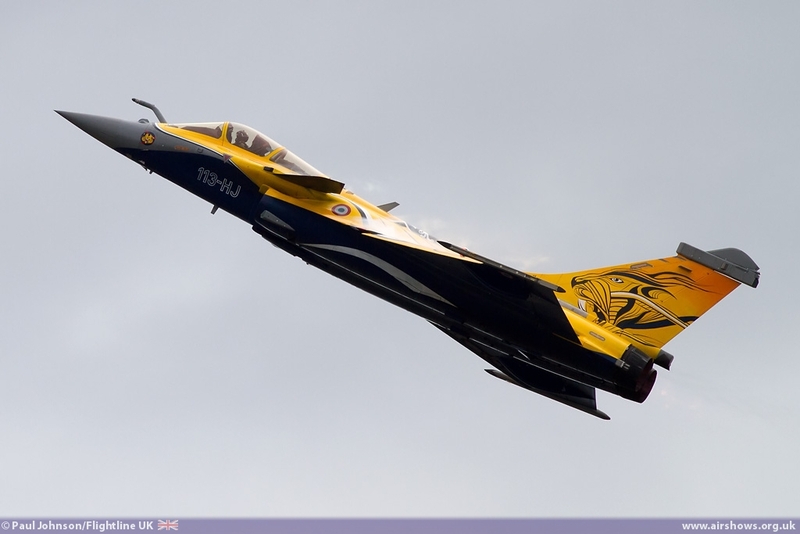 It was joined by the equally colourful tiger-schemed Dassault Rafale C from the French Air Force which gives a very and aggressive display of the aircraft agility and turn of speed! 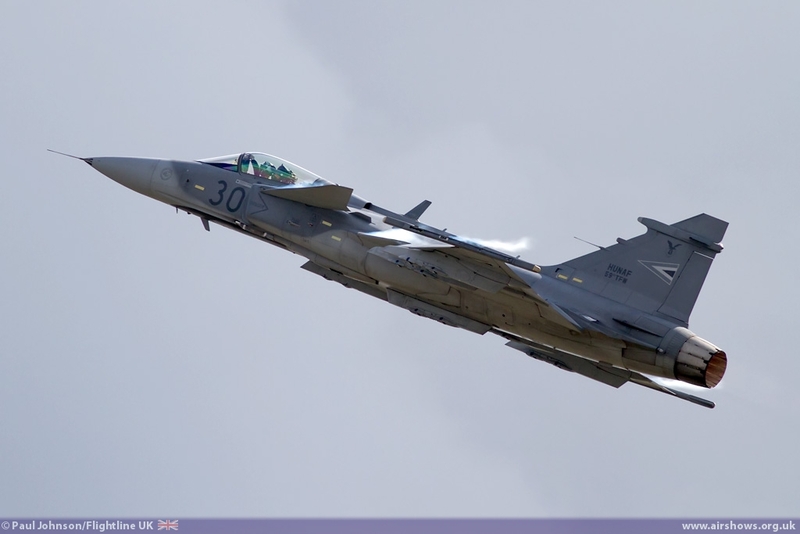 Adding to the impressive list of East European Air Forces taking part at Sanicole were the Hungarians with their SAAB JAS-39C ERS-HU Gripen. 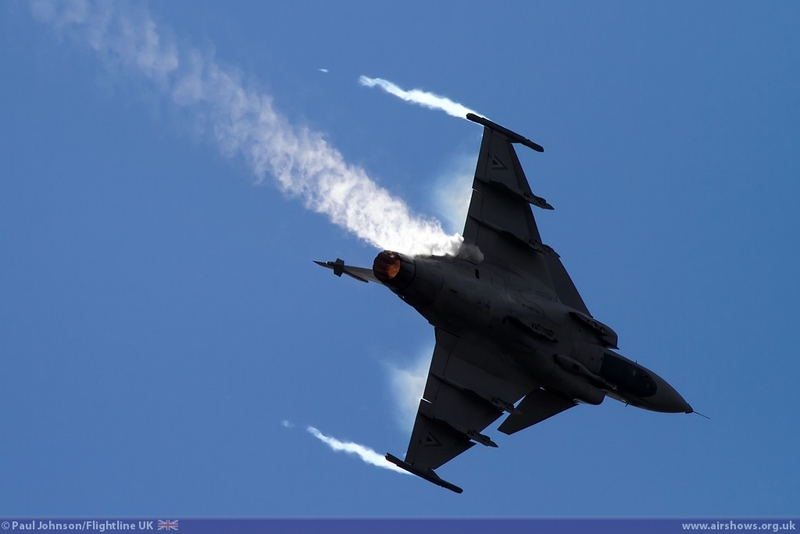 The Gripen is fast becoming the jet of choice for the East European nations as they gradually retire their Russian made jets. 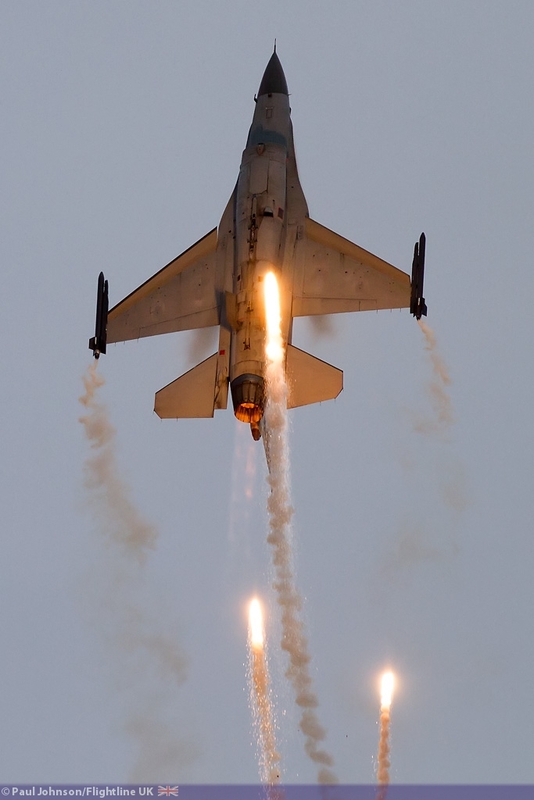 The Hungarian display certainly grabs attention making plenty of noise for itself as well as providing the odd flash of flame dumping fuel into the aircraft reheat, though you have to have great reactions to capture it on camera! 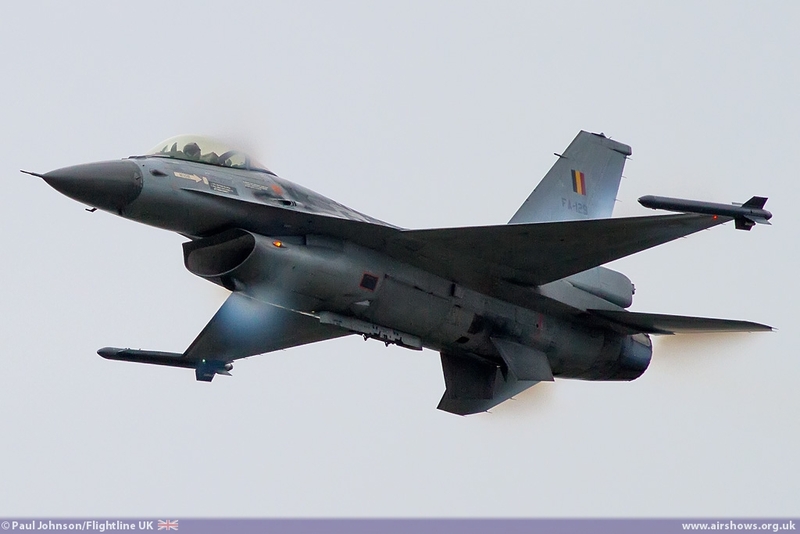 Closing the show following a technical fault with the main display jet was the Belgian Air Force F-16AM Fighting Falcon. 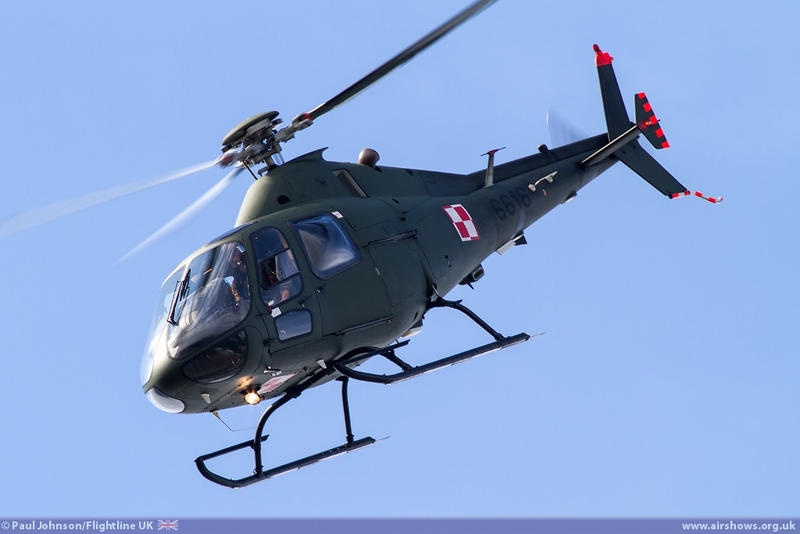 It arrived in company with the A109BA for some formation passes which really did test the slow flying ability of the big jet! 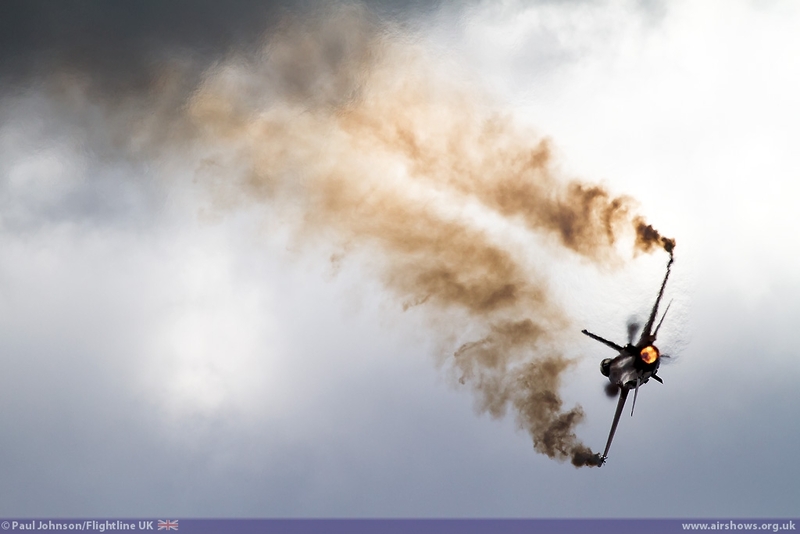 As ever the full solo display was a feast of noise and flares to round off a superb show. 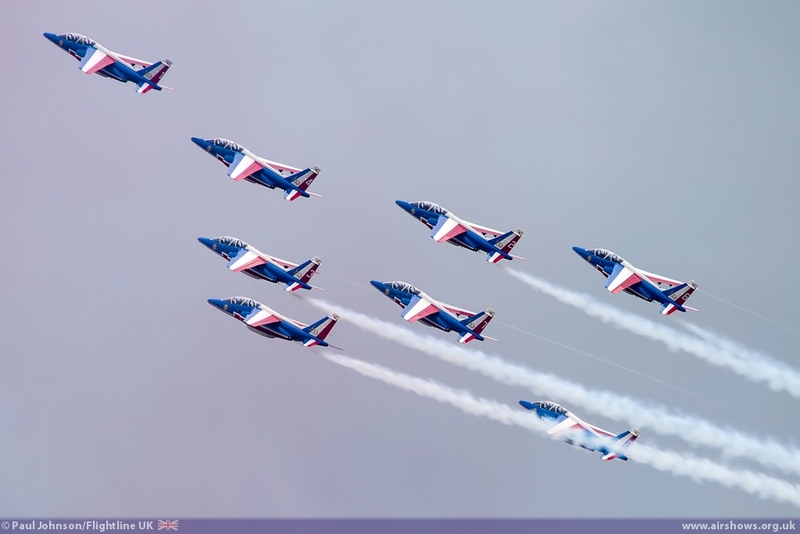 Despite all the difficulties of weather and serviceability, the International Sanicole Airshow once again provided one of the best flying displays of the year full of variation and quality. 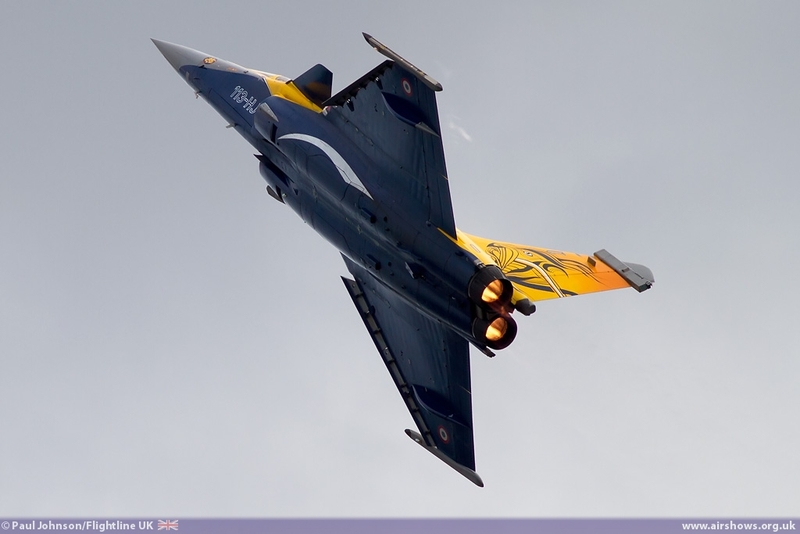 In many ways it is sad that there will not be a Sanicole Airshow next year as the event always has a great atmosphere. 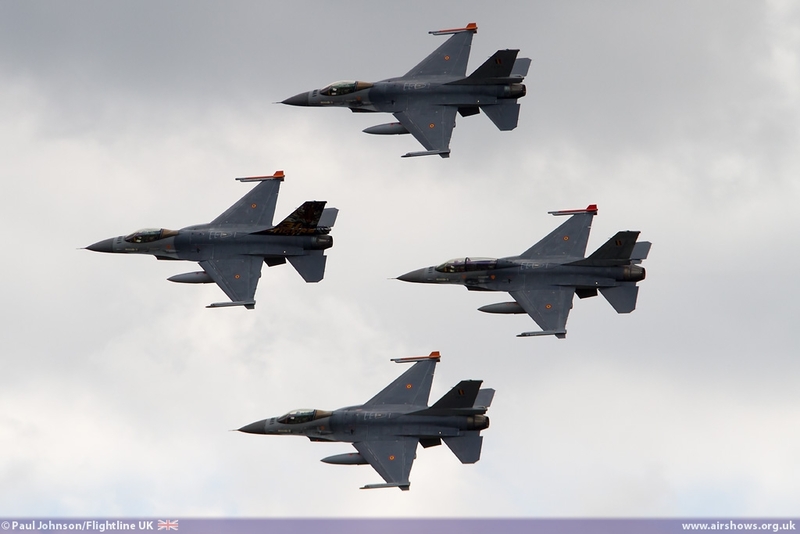 However, the Kleine Brogel Air Force Days promise to be a great event which will be supported well by the Sanicole team! 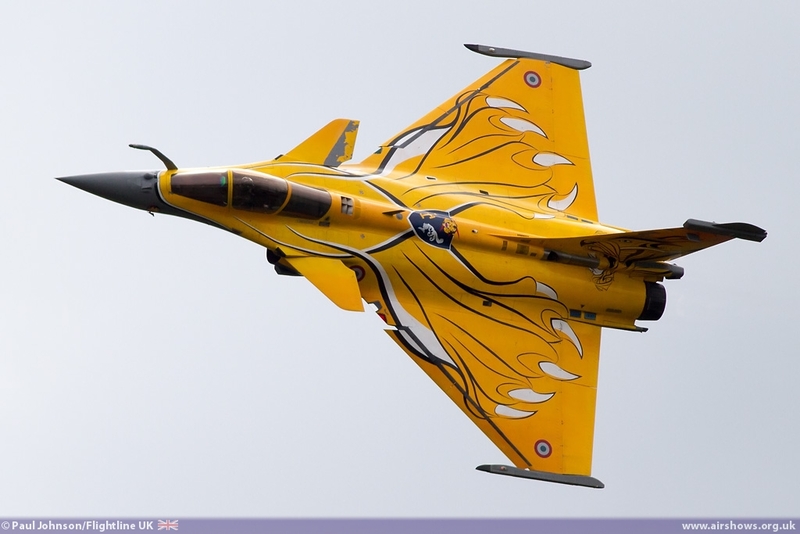 The International Sanicole Airshow will return in 2015 and we very much hope to be there!